There is a certain amount of relief in Reuben’s eyes as he lays in his bed this evening. Finally a day when he is not dragged up a wind-swept mountain or up to his belly in bog. The car is outside cooling down after a 1,193 mile round trip to Sutherland in the far north of Scotland. I shudder to think what the final petrol bill is. A total of eight days were spent backpacking among some really wild and empty landscapes, with an atmosphere totally unique to the far north. The autumn colours are at their peak up there, I did not realise that it was possible to get so many different shades of brown. The autumn light shining on all those yellows, reds and browns resulted in a real treat for the eyes. We started off by heading for three days into the vast Ben Armine Forest. 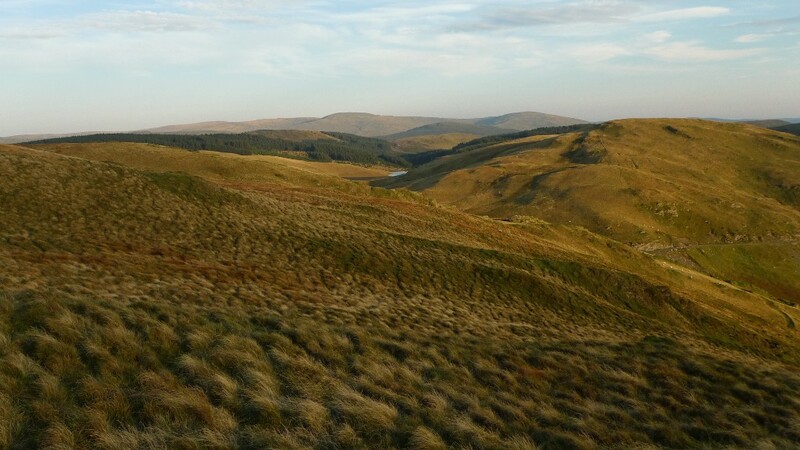 This is a huge sprawling area of high moorland that reminded me of the Monadhliath mountains. 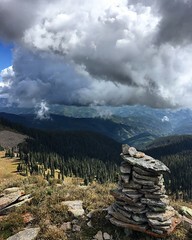 We climbed to the summit of Ben Armine itself which is reputed to be the most remote Graham (for non hill baggers this is a hill between 2000ft and 2500ft). The view from the top was breathtaking, with the Flow Country laid out at our feet. 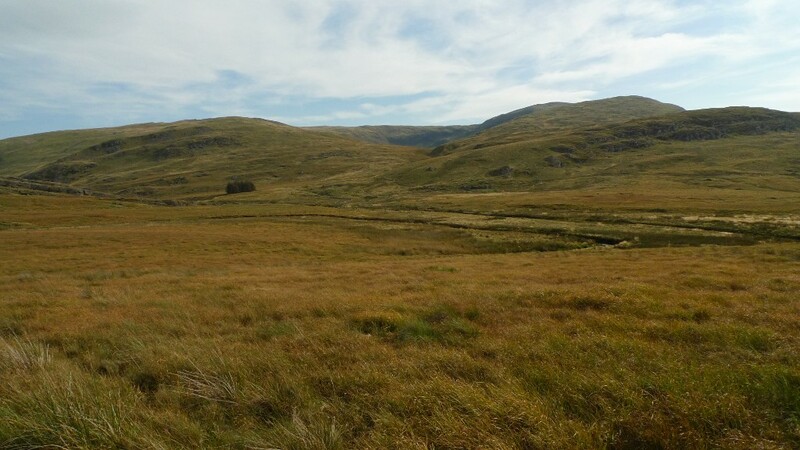 The photo above is from the Bealach Easach looking towards Loch a Bhealaich. Our second backpack saw us heading across the Flow Country itself. This is a land of huge skies and it was slightly unnerving heading across what felt like an endless bog. The reward was a lovely bothy at the end of the day. The photo above is of Pete making use of the argocat track that thankfully went in our direction for a couple of miles. 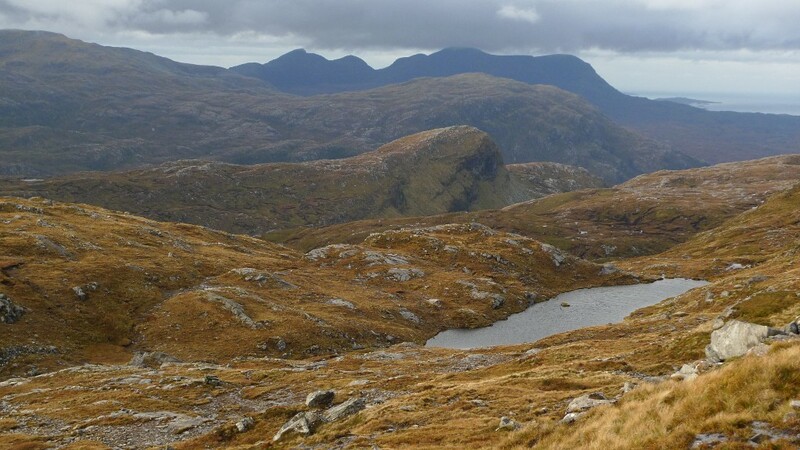 Our final backpack was for three days amongst the rugged peaks of Assynt. This is a real primeval landscape, the raw bones of the earth being thrust high into the sky. The map is a chaos of contours, rocks and lochans begging to be explored. Thankfully the weather was kind enough to let us climb high and enjoy the views. 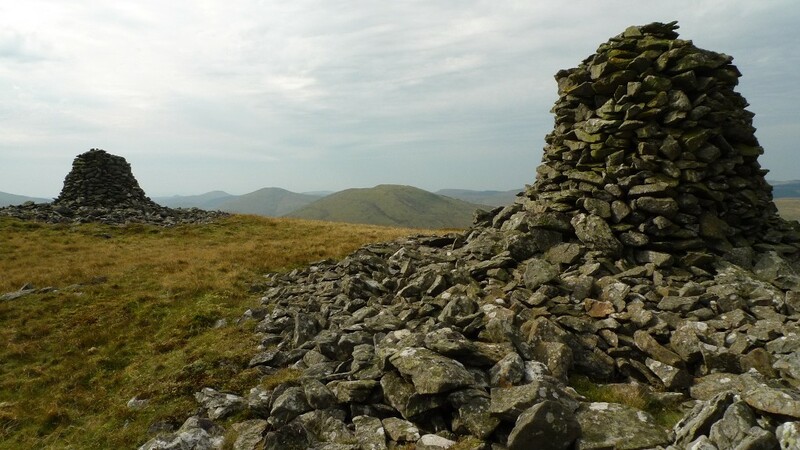 The photo above was taken on the ascent of Beinn Leoid. The Stack of Glencoul is in the middle distance with the mighty Quinag on the horizon. As time allows I will put up three separate trip reports. In the meantime I will leave you with my impression of a new bit of gear I took along. I wore a brand new pair of ‘proper’ leather walking boots. Eight days of wading through some of the sloppiest ground imaginable and my feet remained dry, comfortable and blister free. I also did not fall over once. Was that a deep intake of breath from the back? Do you often find yourself revisiting the same place over and over again on a map? Do you have a spot which for some reason fascinates you, but you are not sure why? Do you ever have the urge to visit places that are ridiculously remote and inaccessible? I can safely answer yes to all of the above which often leads to a large outdoors ‘itch’. From Saturday I will get the opportunity to give that itch a damn good old scratch. I have to admit that I enjoy visiting bothies, especially if they are situated in wild and remote areas. For me they compliment the wild places and I love the sense of place you sometimes get when walking through their doors. At this time of year, when the weather starts becoming even more unpredictable they can provide very welcome shelter. Sitting in front of a bothy fire whilst a storm rages outside is a great pleasure. 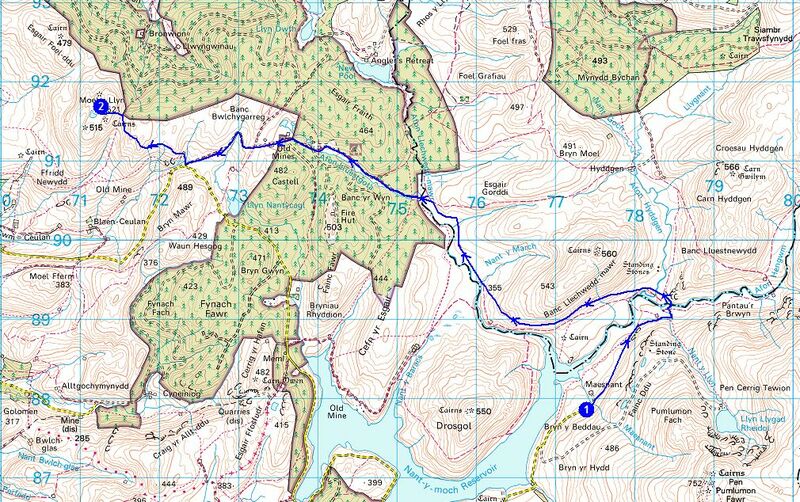 Therefore I have planned a trip that makes remote bothies the central focus. Sutherland is a magical place, it looks like the bare bones of the earth have risen to the surface. 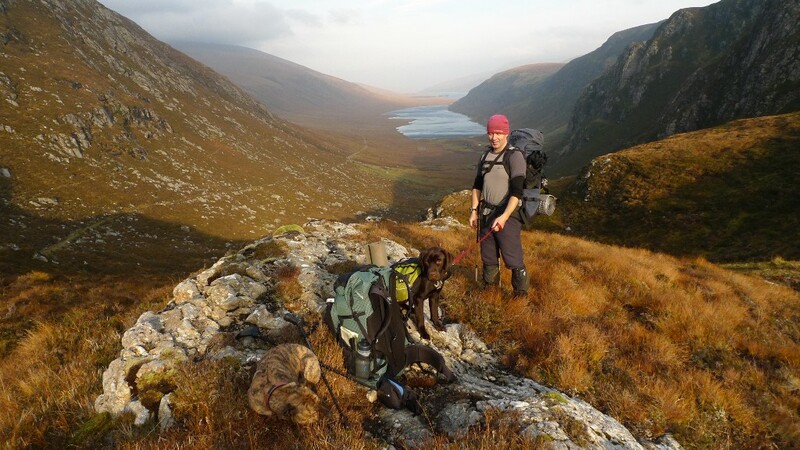 It is full of iconic peaks that should be climbed at least once in the lifetime of all hillwalkers. They are not part of the plan. The places that fascinate me and will be the focus of the trip are probably unknown to many people, perhaps that is why I am keen to go. 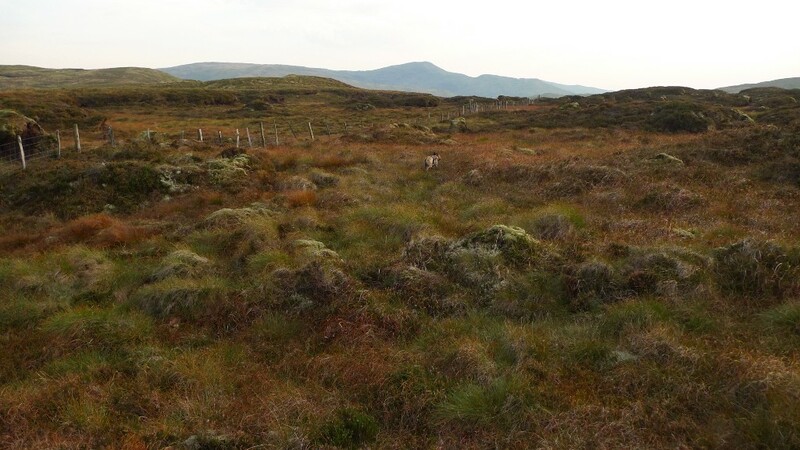 The Ben Armine Forest, Forsinard, A’mhoine, Glendhu forest, all places that I have obsessed about on the map for years. Will they live up to my expectations? 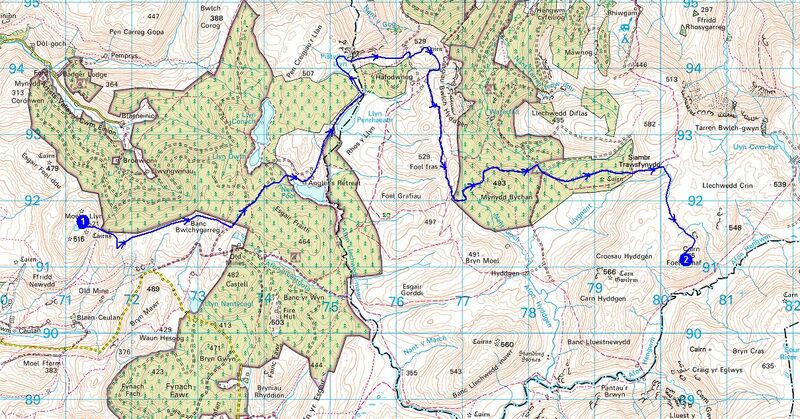 Fellow blogger Pete from Writes of Way, myself and our two dogs will be doing a loop from Lairg up to the north coast. Rather than do one long backpack we will be doing several short ones of 2 to 3 days duration. This means that extra food and clothing can be left in a vehicle and picked up after each foray into the hills. 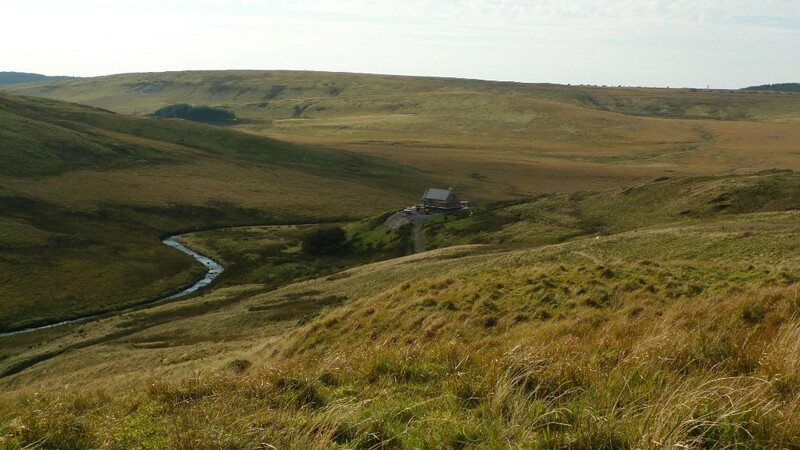 Unfurling my maps and looking at a tiny building located in the middle of the vast Sutherland moors gives me butterflies. Will it exist or be locked? Will anyone be there? Will there be wood to burn? 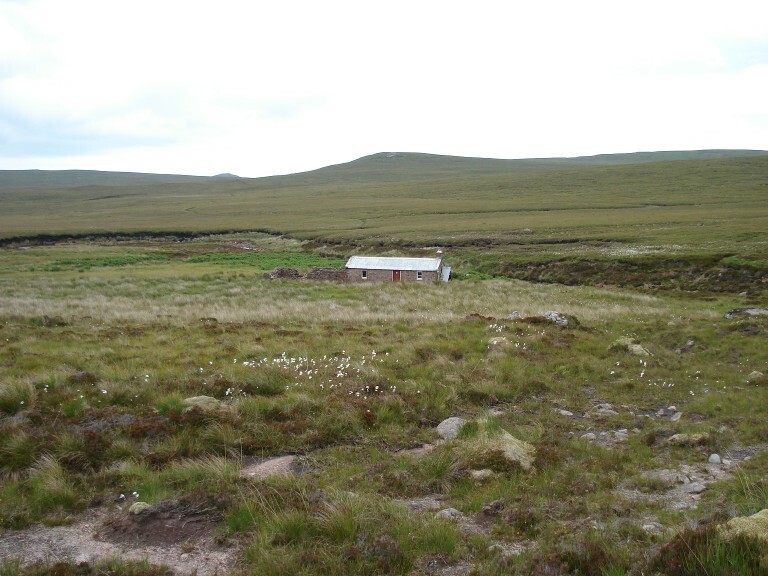 It is over four years since I visited the far north, sleeping in this lovely bothy tucked away miles from the hustle and bustle of the 20th Century. Just a shame that it’s a two day drive to get up there! 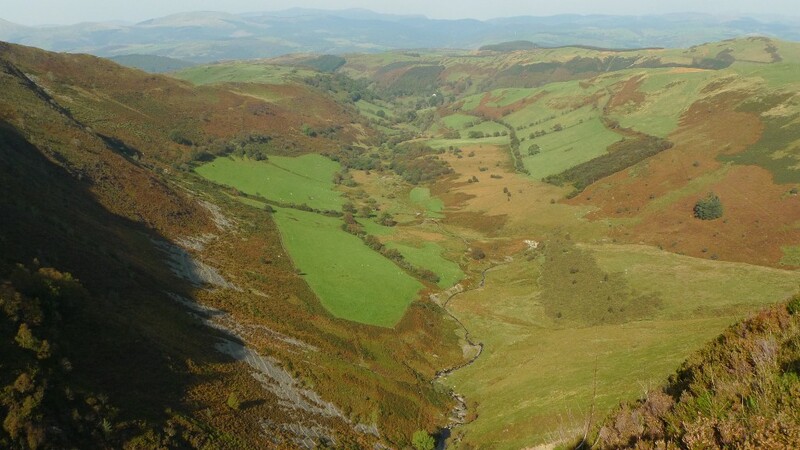 I nearly missed the turning from the busy A44 which links Aberystwyth and Llangurig, my eyes on the lovely Welsh scenery. The slow procession of traffic building up behind an unknown driver in no hurry was soon left behind as I entered a much emptier world. For five miles the single track road twisted and turned its way deeper into the hills, with the occasional rumble as I drove over a cattle grid. 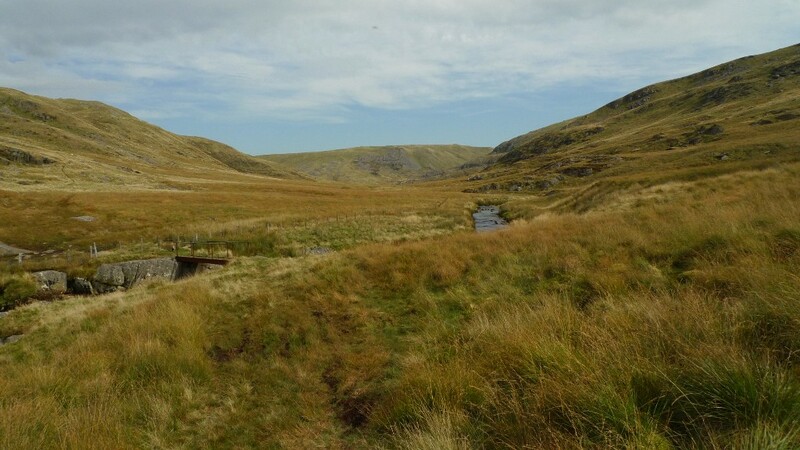 At a fork in the road I turned left, descending towards the eastern arm of the sinewy Nant-y-moch Reservoir. The road suddenly came to an end just before the outdoor centre at Maesnant, where I did a twelve point turn to get the vehicle pointing back the way I had come. The car was deposited at a small pull in a hundred metres back down the road and I turned off the engine. Opening the door and stepping outside I heard my favourite sound, silence. I had arrived to explore what may be lost. I was thankful that the area was deserted whilst I stood on one leg in my underpants, trying very indiscreetly to get changed out of my jeans. I have to admit that I spent much longer than needed generally having a faff, aware that it was late and getting dark much earlier. Reuben, occupying the back seat among piles of hair and slobber was very eager to get going. There is something deeply satisfying about starting a walk into the middle of nowhere from the middle of nowhere. You immediately feel free and the stresses of everyday life quickly start melting away. 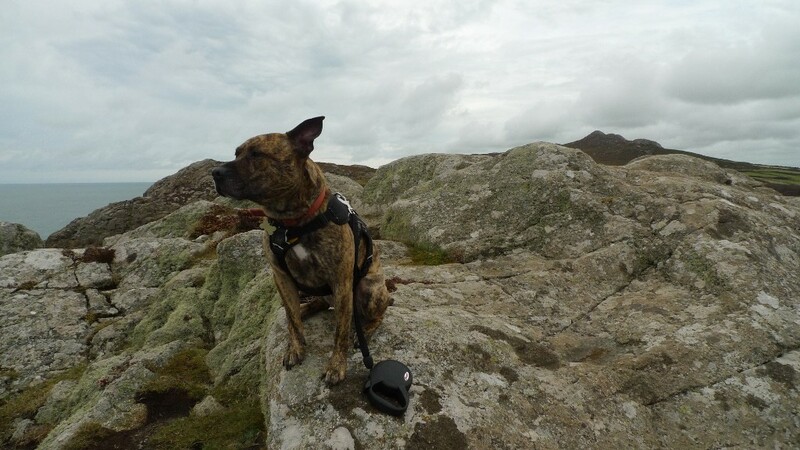 With no sheep in sight Reuben started from the car with his lead tucked away in my rucksack pocket. 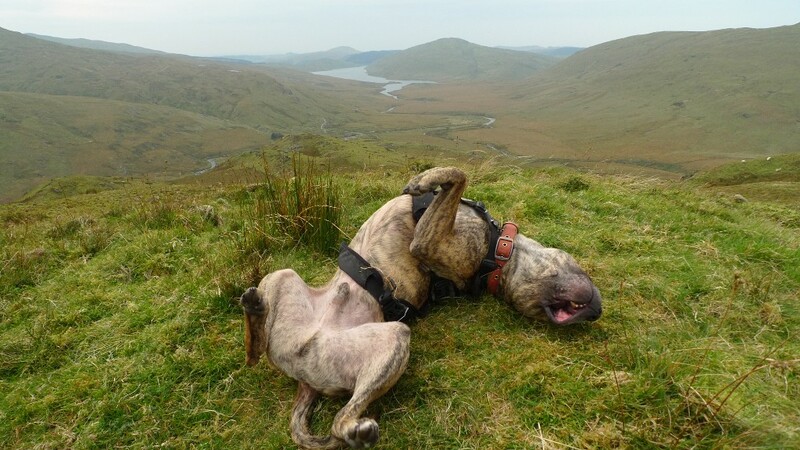 He relishes his off lead moments and decided to celebrate by doing his version of a forward roll. This involves him running at full pelt before launching himself onto his back. A good firm track heads from the end of the road towards one of my favourite Welsh Valleys, the Afon Hengwym. However I took a moment to look back across the tussock grass whispering gently in the breeze. 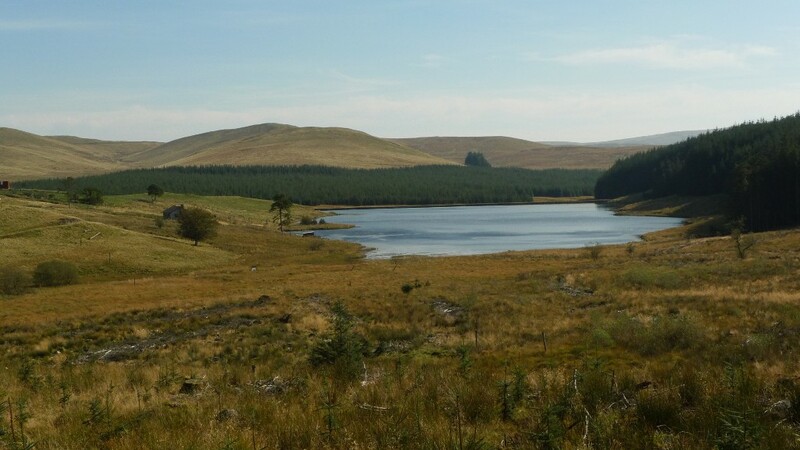 In the near distance was Drosgol, a lovely little conical hill that rises steeply above the reservoir. 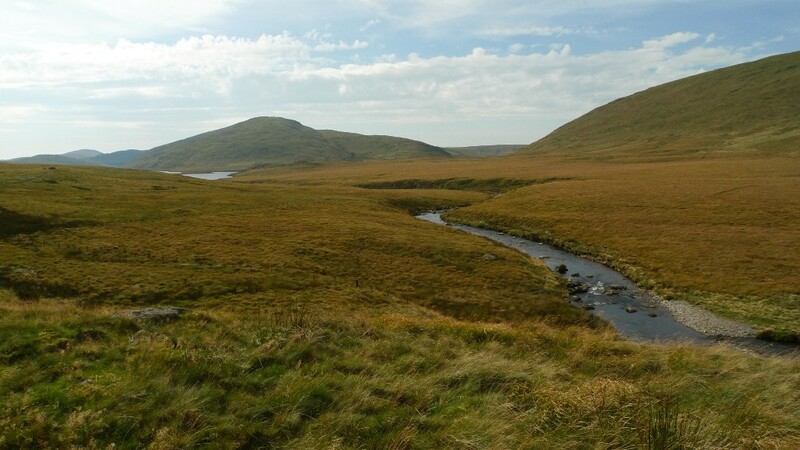 My route was heading to the north of Drosgol, but a slender finger of the reservoir meant that I would have to take a lengthy detour to get there. Therefore I continued walking in the opposite direction, a feeling of wildness growing with every step. Just upstream from where the Hyddgen meets the Hengwm there is a footbridge, essential for a crossing after heavy rain. I cast my eyes into the sublime valley of the Hengwm, a place of solitude barely touched by the hand of man. A bridleway is marked on the map but this is often non-existent on the ground. A ruined building further up the valley to me adds to its haunting beauty. 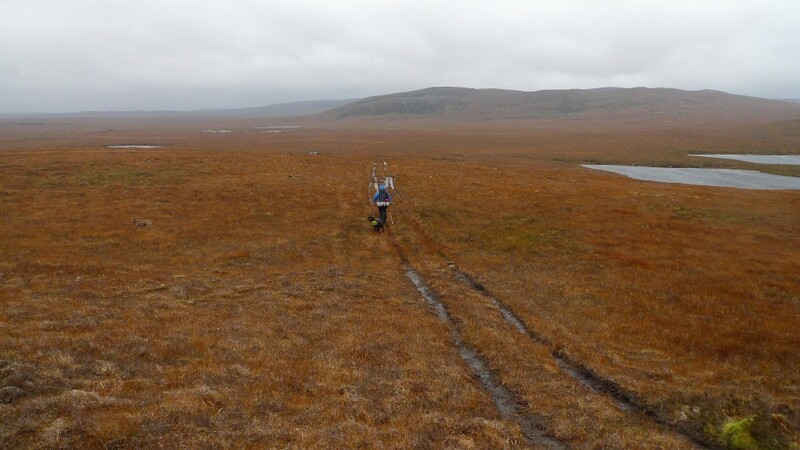 You know that feeling when you backpack in the Highlands of Scotland and are about to enter a really remote area? There is an intangible feeling that you can’t really put a finger on. That is how I felt when I first came here many years ago. Geoff, the seeker of solitude with his excellent site v&g backpacking in Britain wrote this about the Hengwm, ‘Only at the bottom of the slope on a clear sunny morning did I appreciate the sense of scale of this empty valley, and in a strange way I felt more like a backpacker here than a hillwalker, if that makes sense‘. If you pay a visit, it most definitely does makes sense! 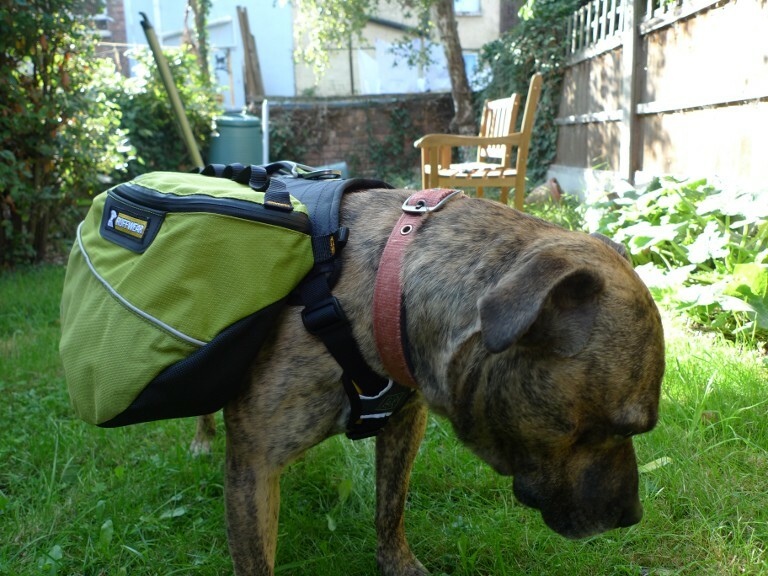 Anyway, I am waxing lyrical about a valley I ended up not visiting on this backpack. Sadly I turned my back on the Hengwym and headed west to cross the Hyddgen. This river is unbridged at this point but thankfully water levels were low and I managed an easy wade across. The aim was to contour the hill Banc Llechwedd-mawr along a non-existent bridleway. I could see the line I wanted to take as it looked to be nice green grass. The problem was that I had a series of deadly tussocks to cross to reach it. Reuben for some reason loves this sort of terrain and he bounds up and down, taunting me whilst I lurch from step to step. The view south across this sea of devil grass is towards Pumlumon, a cracking hill which is well worth a visit. A climbing traverse of the hill soon brought me to a series of sheep tracks and I made good progress onto the shoulder of the hill. The actual bridleway then made an appearance below me, somehow I had climbed too high. A grassy prow made a good place to stop and contemplate my surroundings. Below was a building that was in the process of being renovated. It is in a truly lovely position and many years ago I camped next to it with a couple of friends. 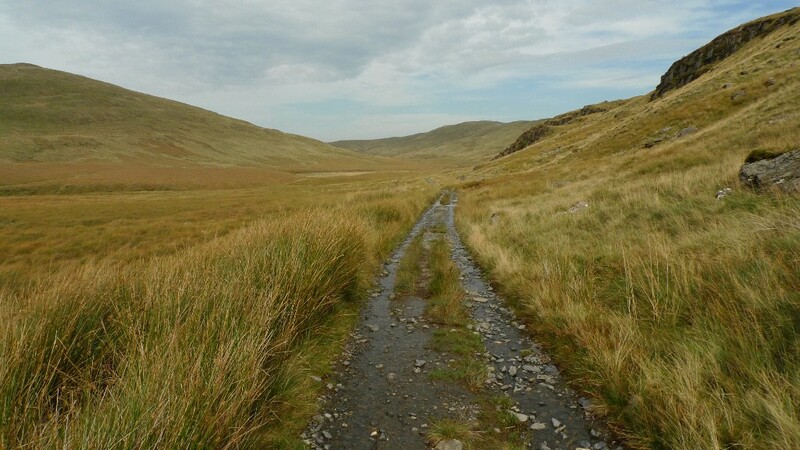 Access is via a very long track which eventually leads to the mountain road from Tal-y-bont. The owners have got themselves a cracking little place to escape. But will they be able to escape there for long? The map I have seen of the proposed Nant-y-moch wind farm shows that some of its many turbines will be pretty close to their little patch of heaven. 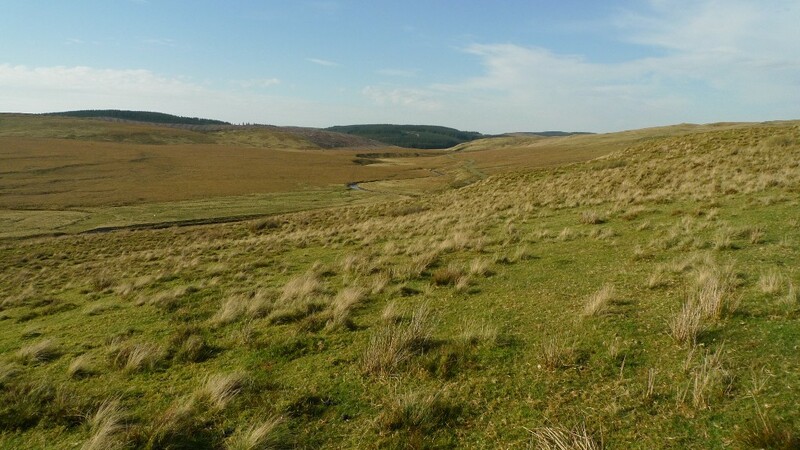 Rather than descending to the building and track, I continued to contour into the flat open expanse of the valley containing the Afon Llechwedd-mawr. This is sheep country and as we reached the track I was aware that this would be one of Reubens sternest tests yet. Whilst we marched the kilometre or so up the valley we were often no more than a few metres from a woolly creature. Reuben although off lead was kept right by my side and he barely batted an eyelid as bundles of wool ran off in all directions. It was a proud dog owner who forded the river into sheep free forestry for a hot slog through an area of disused mine workings. 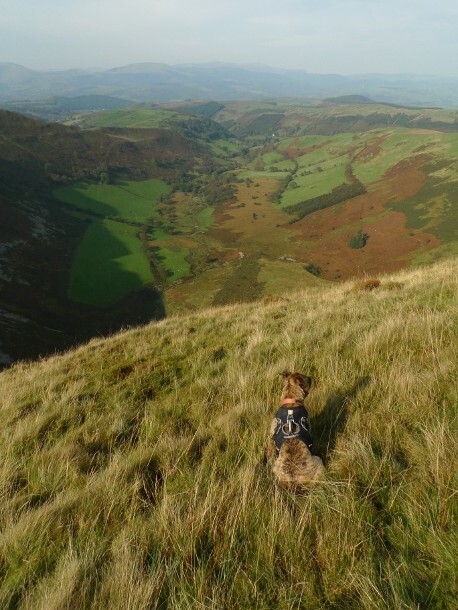 Having a dog off lead in sheep country means constant vigilance, lots of talking and praise. I have discovered that Reuben is fine when surrounded by sheep out in the open. He only shows interest if we come across one by surprise, something I have to anticipate to avoid a chase situation developing. 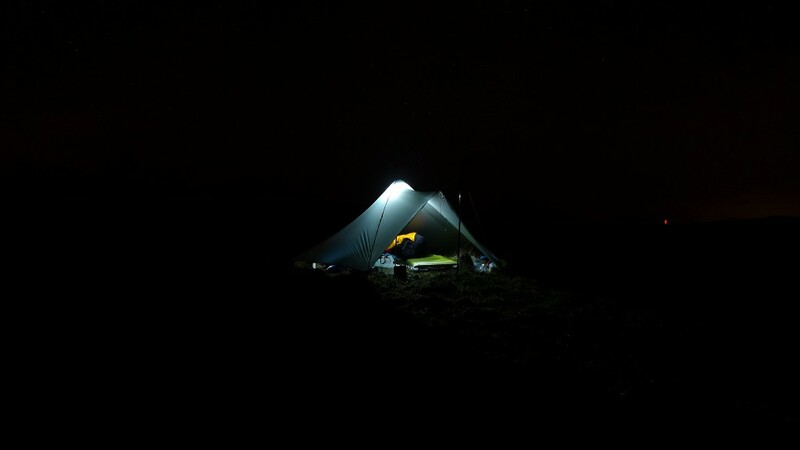 My destination for the night was the summit of Moel Y Llyn and I realised I had a way to walk and not much daylight left. As I approached the minor mountain road the early evening light started doing magical things to the flat expanse of sea on the Horizon. 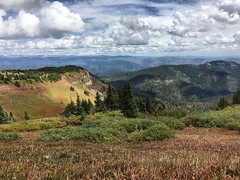 The tussocky grass once again slowed me down as I contoured the slopes, heading west towards the summit. 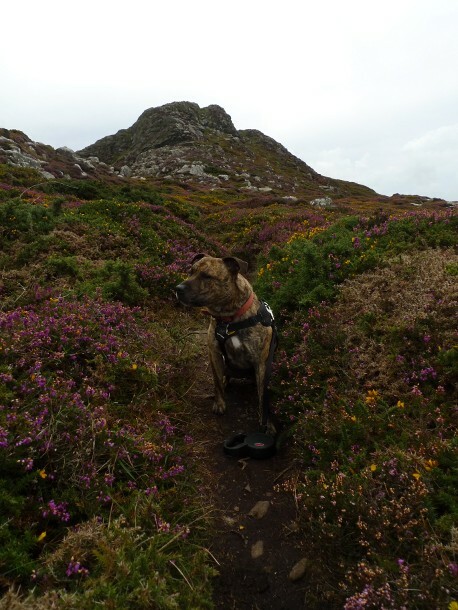 Tussocks mean nothing to an enthusiastic dog who suddenly gains a second wind, Reuben was again in his element doing doggie forward rolls. I stopped for a while and glanced back at the way I had come, Pumlumon dominating the horizon. 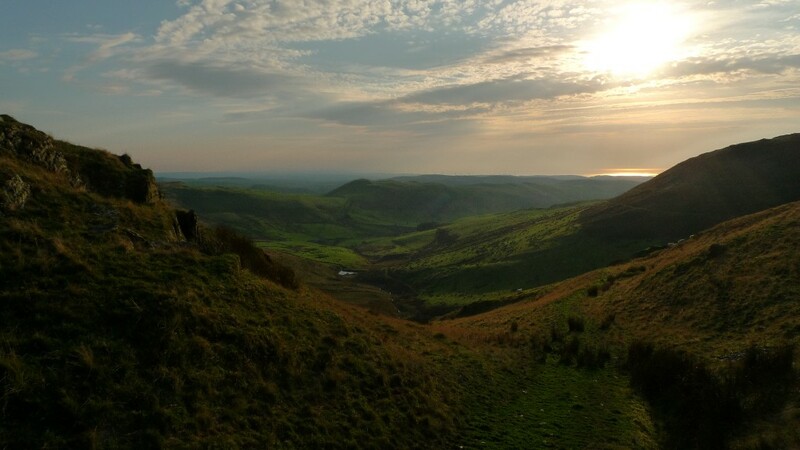 In a few short years the landscape you see below may be covered in giant turbines. Do you feel that this is a landscape worth saving? I most definitely do. I passed a stream flowing freely from the source marked on the map. I didn’t fill my water bottles as there was another marked on the map closer to the summit. 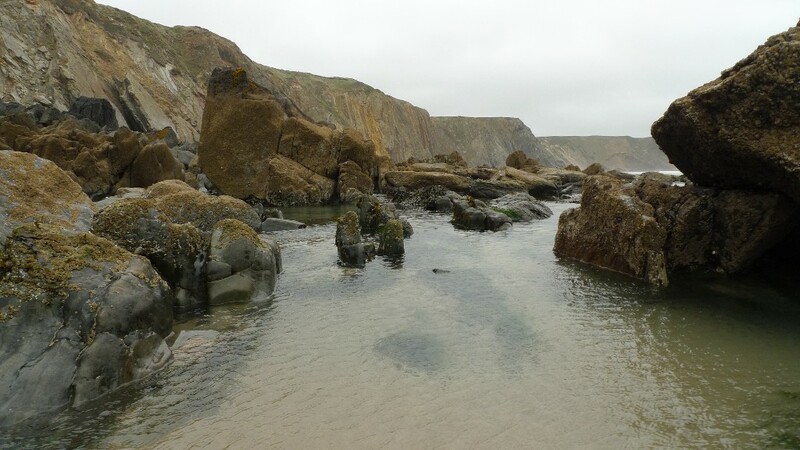 I continued on to my chosen watercourse and found that it was bone dry. 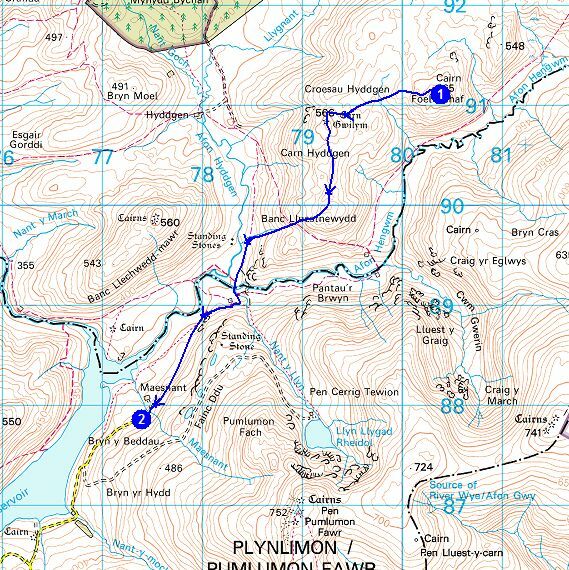 A dilemma, do I backtrack 20 minutes to the last running water or do I take a risk by taking water from the Llyn on the summit? Laziness won the day and I climbed to the summit without any fresh water. 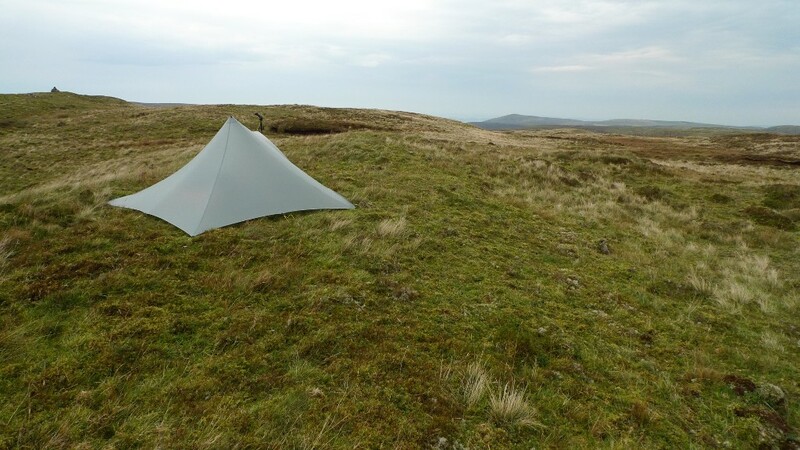 It was much windier up there than expected and I spent a long while wrestling my Trailstar into a useable shape. Once up it was solid but it was a minor ordeal getting there. 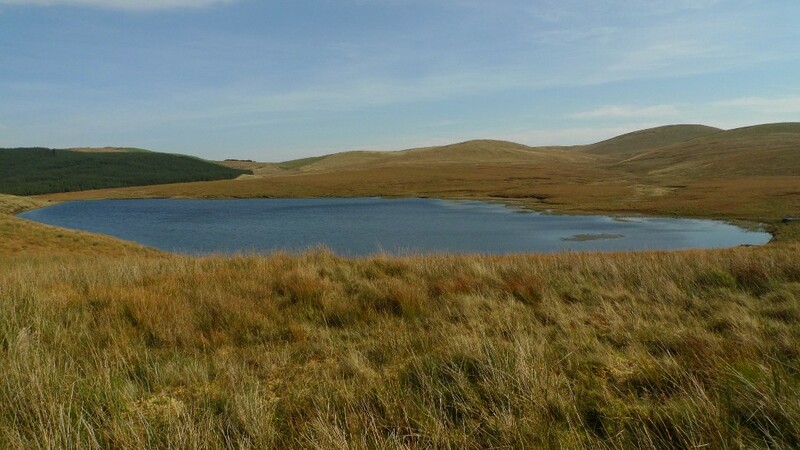 The Llyn was a short walk below the summit and I filled my bottles with surprisingly clear water. I was glad that I had brought my Travel tap along with me, I would not risk drinking the water otherwise. 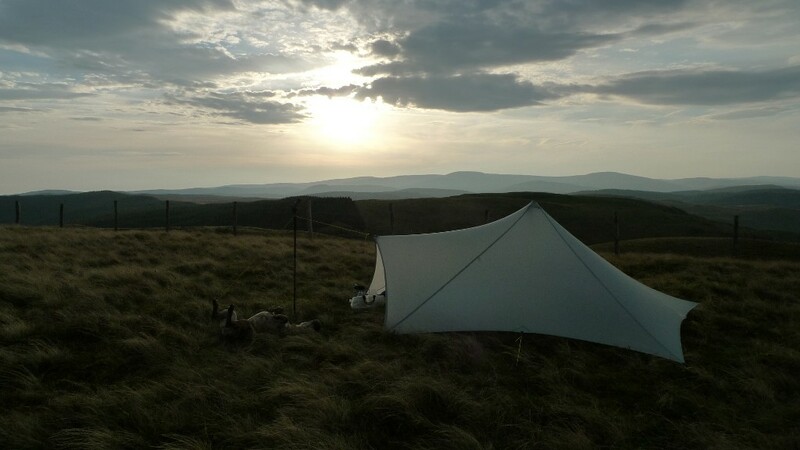 I returned to the Trailstar in the gloaming, the earlier promise of a sunset extinguished by a bank of cloud. 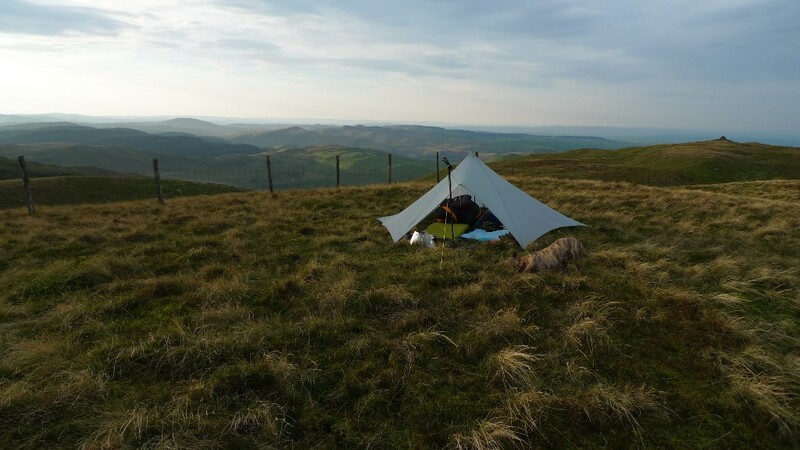 I had a fitful nights sleep, still unused to being in an open shelter rather than a tent. It was novel laying there with no barrier between my head and the dark night. I slept badly because I was too hot, I had taken my winter sleeping bag, which only has a quarter length zip. I woke up in a sweaty mess at 3.00am and checked the thermometer on my watch, it was still 17 celsius on a hill top on the 1st October! The wind was still strong in the morning but it carried with it an unusual warmth. Even at an early hour I was in a t-shirt. With a hot drink in hand I took time to take in my surroundings and was mesmerised by fold after fold of hills disappearing into the distance. 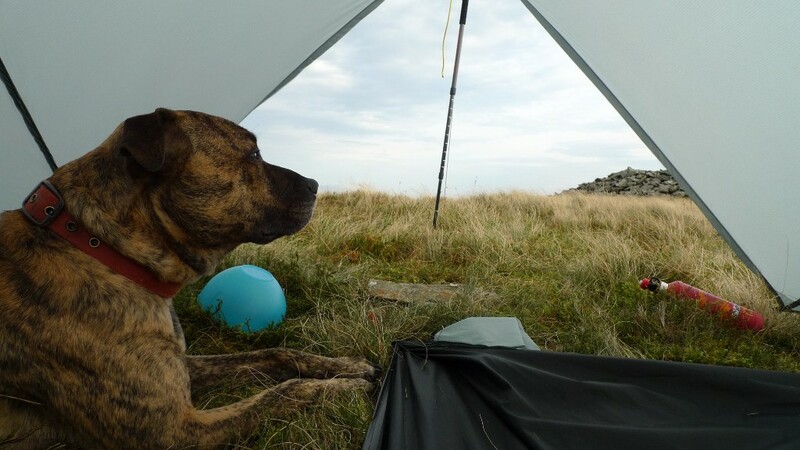 I have noticed on other outdoor blogs photos of the insides of the blog owners tent. I have always admired the tidiness of these bloggers, my tent always resembles the aftermath of some out of hand party. Things for me get even more out of hand in my Trailstar as there is not really a secure corner to pile things into. Every time I need my lighter means a frantic ten minute search. 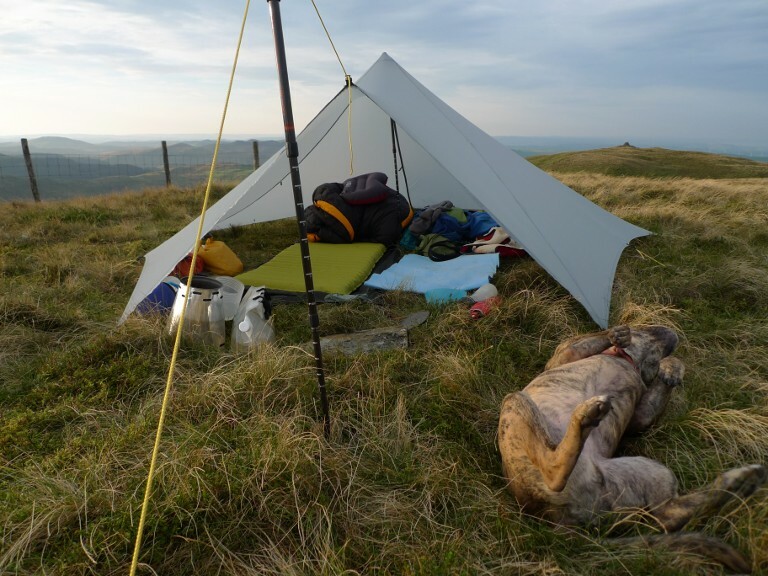 This is what a Trailstar looks like after Reuben and James have spent a night in it. 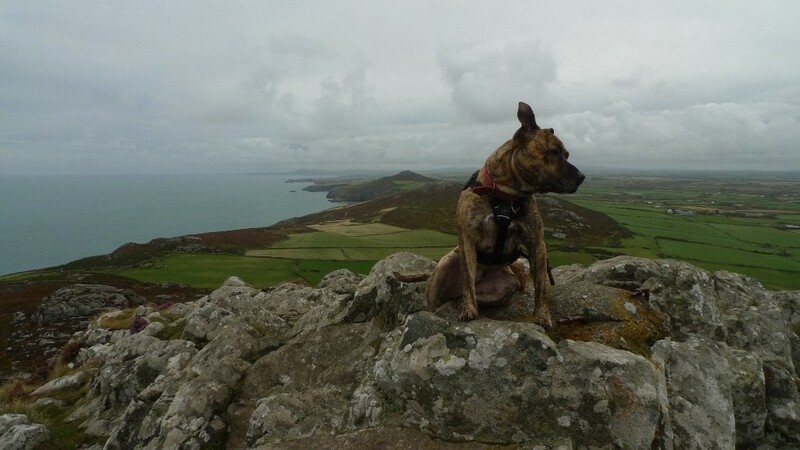 And looking out from Reubens perspective. 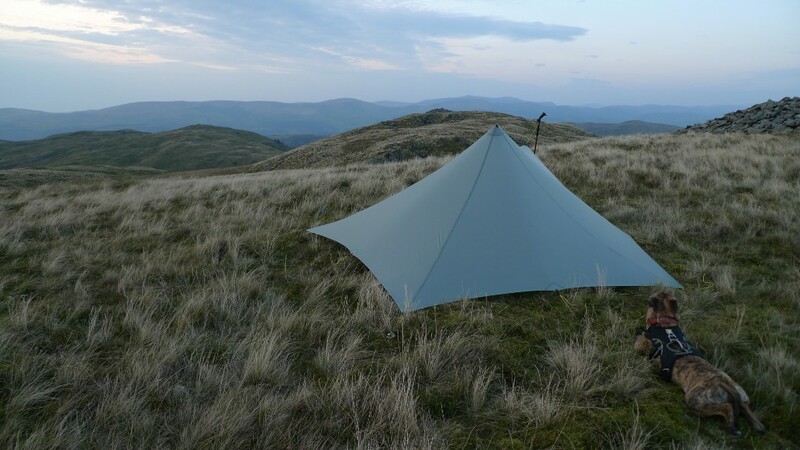 Thankfully it was easier to wrestle the Trailstar back into its bag than it was to set up. 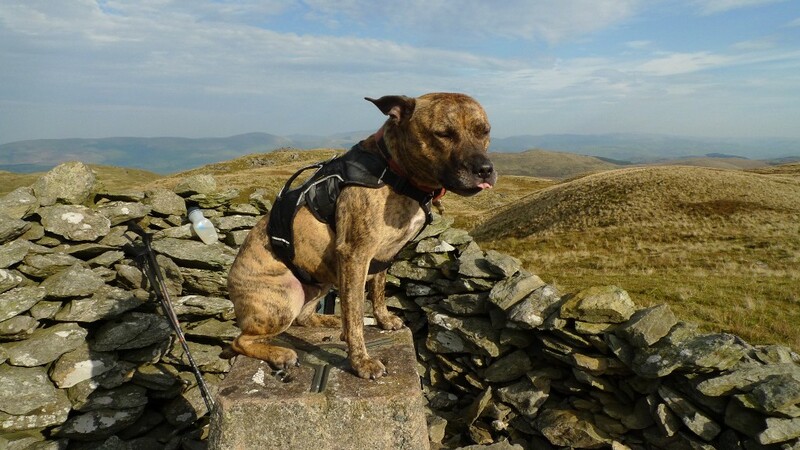 We then walked to the trig point so that Reuben could do his usual celebration pose. A couple of lakes soon lifted my spirits, first the New Pool, surrounded by forestry. And then the much wilder Llyn Penrhaeadr. I wanted to visit the waterfall of Pistyll-y-Llyn, tucked away in a spot well off the beaten track. A right of way was shown on the map heading through forestry but this appeared to be the figment of the map makers imagination. Instead I found a grassy swathe of cropped grass that followed some concrete posts, possibly belonging to the water board. At the top of the hidden falls I found a ledge to perch and take in the stunning views north towards Snowdonia. With shoes and socks off, plenty of food and water, heat and a good breeze, an hour passed very quickly. Reuben as usual was happy to take the opportunity to spread out and take in the sun. Once again the day was slipping away and I still had some mileage to do. The climb up to Moel Hyddgen seemed to go on forever, it was only the views from the edge of the plateau that kept me going. It was here that my left foot started to get really painful, the outside edge unable to support my full weight. I began to wonder if all the rough ground I had crossed in my trail shoes had contributed to my discomfort. I had done a lot of traversing the day before on steep and rough slopes. As I walked along the track towards the Hyddgen valley I fell into a fugg of self-pity. It was hot with no breeze and my water was running low. My foot hurt making progress slow, and to top it off my rucksack developed an annoying squeak from the shoulder straps. Limp, squeak, limp, squeak, limp, squeak……………….. The track gradually descended to the cool of the forest and I came across what I felt was a bit of a contradiction. On a fence post was an ancient walkers welcome sign. The fence post was next to a large six-foot high forestry gate which was firmly locked, blocking the track. Reuben had to be manhandled over the obstacle, to be unceremoniously dumped on the other side. 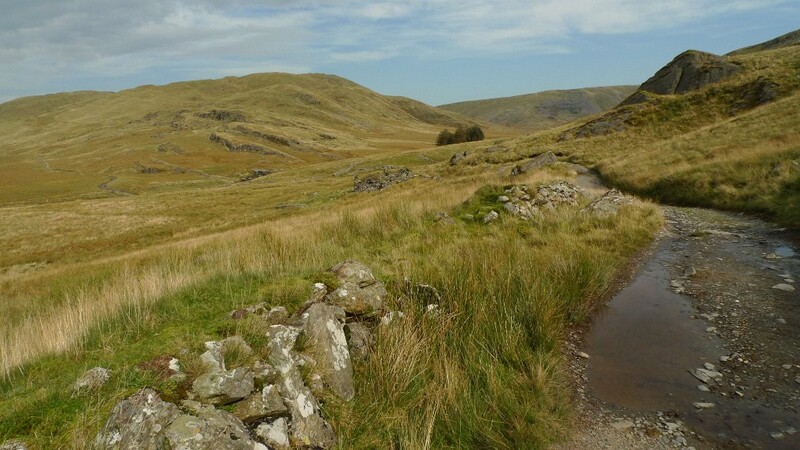 At a junction of tracks there was a sound that is familiar in the Mid-Wales hills, the roar of trailbikes. A large group of them passed in a cloud of dust, the sound echoing around the hills for ages as they descended into a valley. My route climbed once more, passing another locked gate, even though I was now on a bridleway. 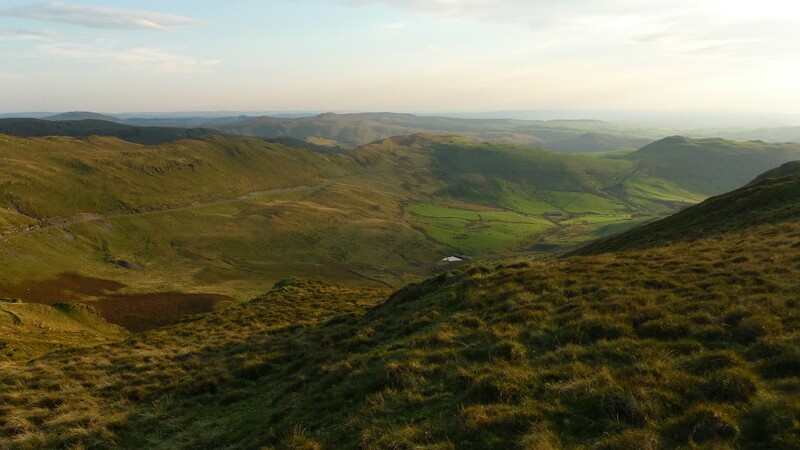 My destination for the night was the summit of Foel Uchaf, unfortunately located a mile across trackless bog. With tiredness, thirst and a painful foot it felt like the crossing took forever. I also began to doubt if the water source I had chosen would be flowing. Darkness was also less than half an hour away. 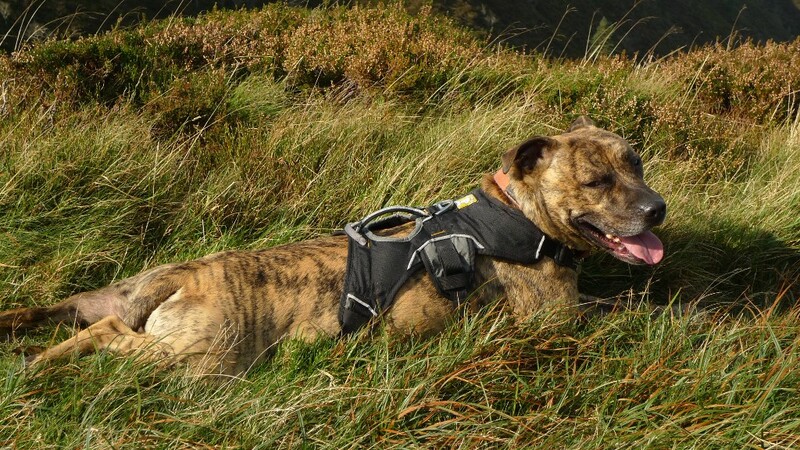 Reuben however after lagging behind during the heat of the day had once again found his second wind, tearing through the bogs like a dog possessed. 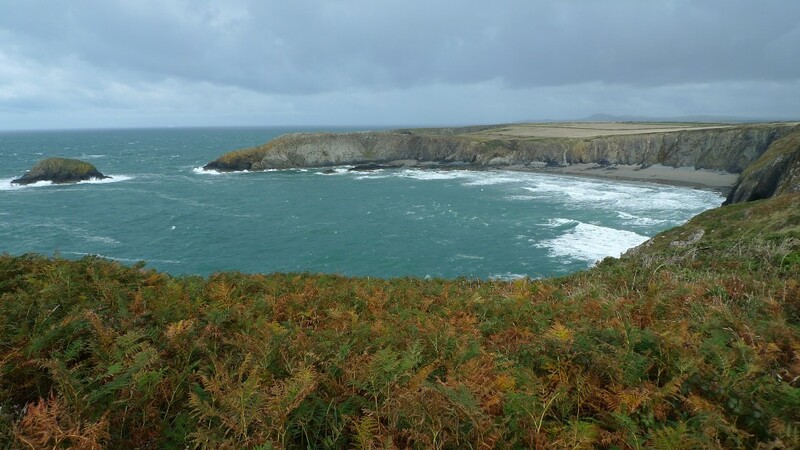 Although the walking was difficult there was a beauty to the grimness, with endless shades of yellow, red and brown. 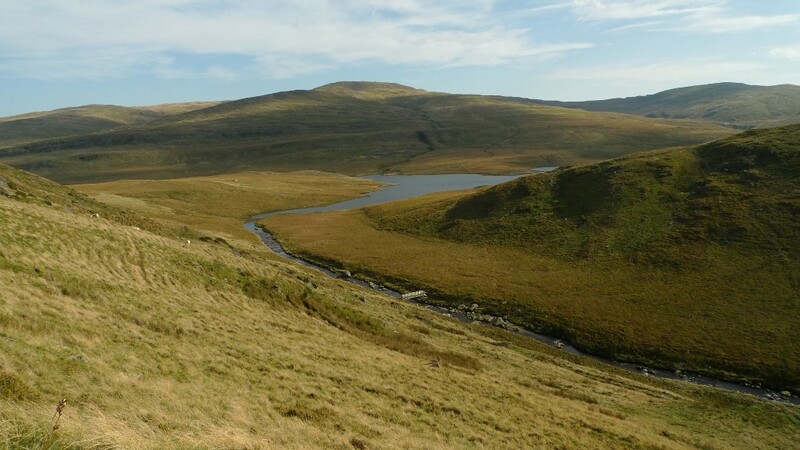 Thankfully the watercourse was flowing and I climbed to the summit of Foel Uchaf fully laden with 5 litres. 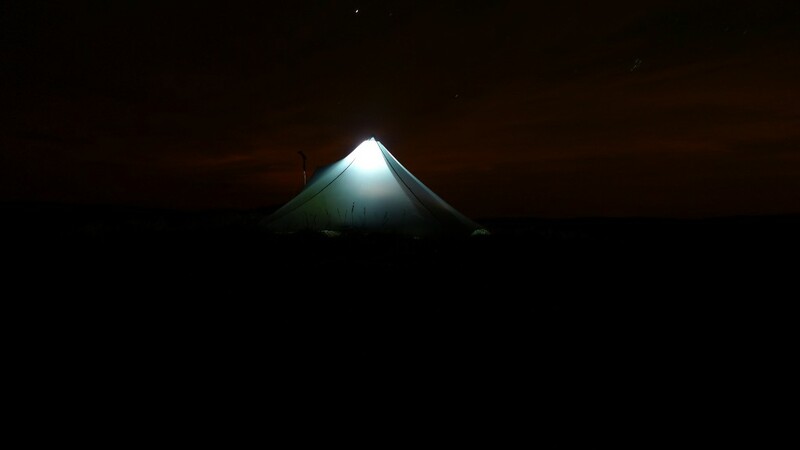 Darkness was coming quickly and I pitched the Trailstar in the diminishing light. Thankfully as darkness came the strong wind dropped leaving a gentle breeze, the clouds cleared and the stars came out. Reuben was totally knackered, he found a spot in the shelter before I had finished unpacking, turned round in a circle a few times and promptly started snoring. I enjoyed being alone on a dark hillside in the middle of nowhere and it was still warm enough to just wear a t-shirt. I spent a while outside playing with my camera before settling down for the night. My plan was to climb Pumlumon on the way back to the car. However I managed to develop a lethal dose of lethargy which meant that it was almost midday before I even contemplated packing up. Sometimes it is nice to simply ‘be’ when in the hills. I was already pitched on a summit so did not feel the urge to visit the larger one situated behind my shelter in the photo below. 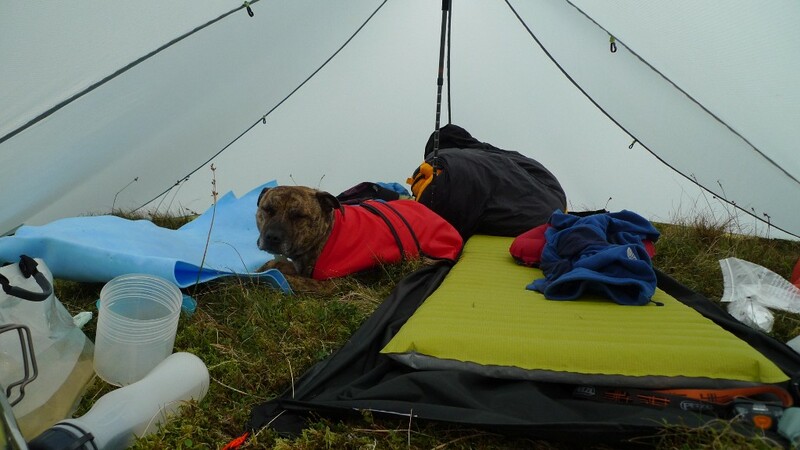 Reuben also did not seem that keen to move, he lounged in the cavernous shelter, snug in his fetching jacket. The lethargy did eventually have to be broken as it was impossible to reach the car without involving at least a small amount of effort. 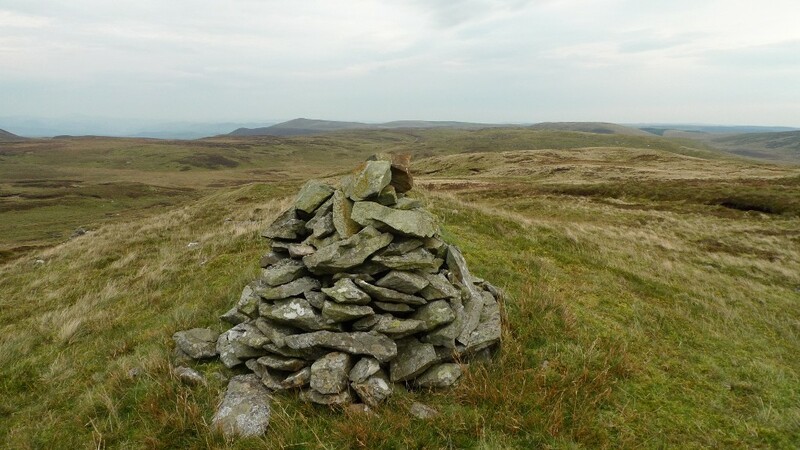 A quick visit to the cairn on the summit where we had slept was in order for a view of the extensive rolling moors. 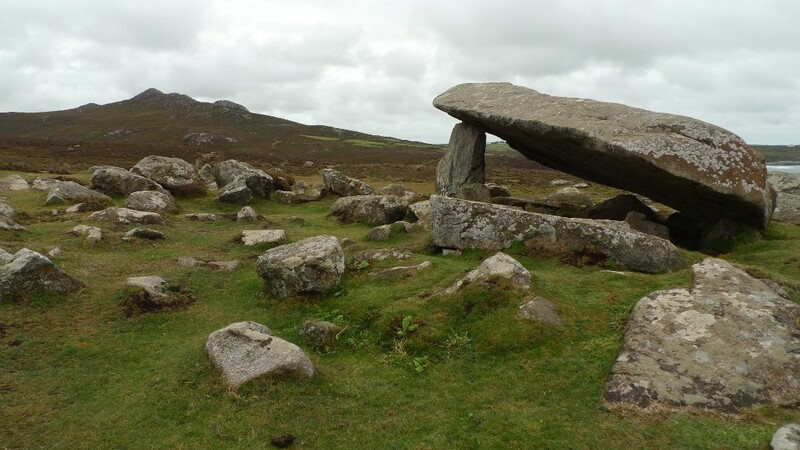 The twin cairns on Carn Gwilym are a dominant feature of the area. The descent and re-ascent seemed further on the ground than it did on the map. On close inspection the cairns are magnificent structures and there are great views down into the bleak and isolated Hyddgen valley. To the south of the hill there was a grassy undulating ridge with Nant-y-moch framing the horizon through the gathering murk. Reuben celebrated the last high point of the weekend by showing off what a good job the vet had done by removing all trace of his doghood. We were soon down in the valley to return along the track back to the car. 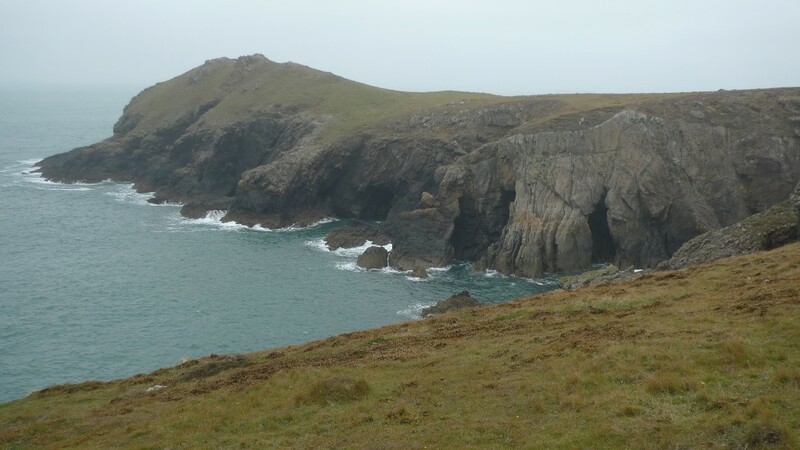 If you have managed to get to the end of this lengthy post, I hope that you would agree that this area is rather special. It is and I urge you to visit. If you get your kicks from rocky mountainous places then I suggest you give it a miss as you may be disappointed. However if you enjoy solitude amongst some subtle but rather lovely hills I suggest that you go now before it has gone forever. And if you have not signed these two petitions, please do. 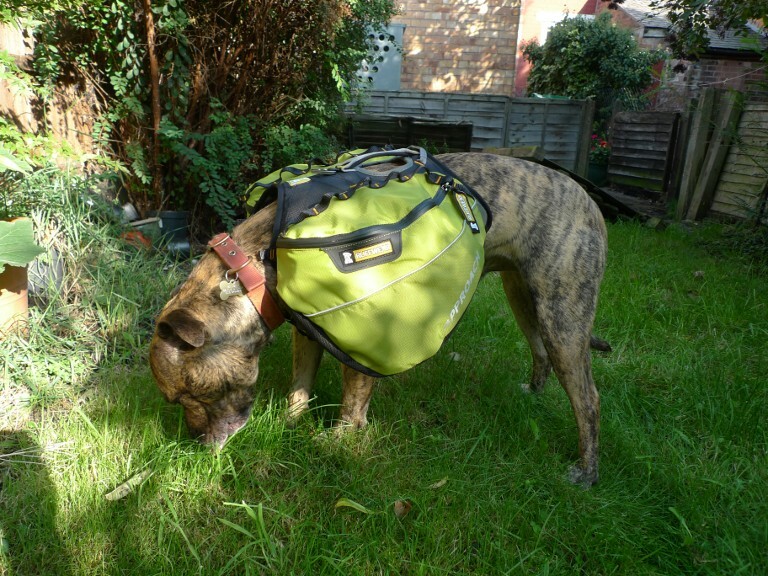 It’s great taking a dog backpacking, but the drawback is that you have to carry their often smelly kit. 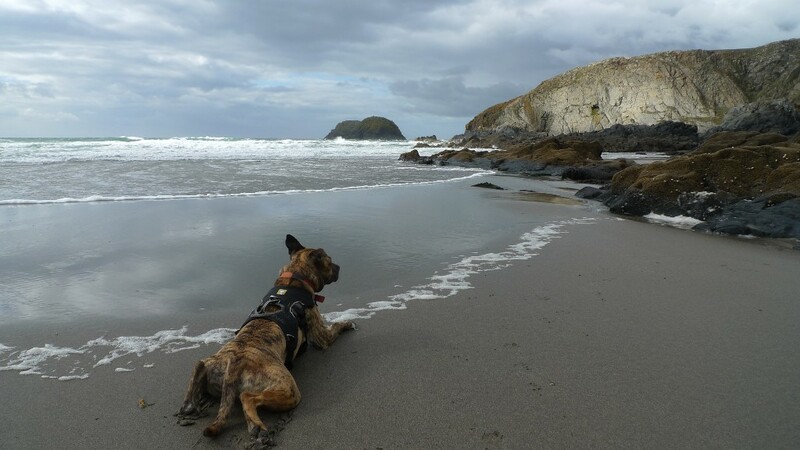 I took a leap of faith yesterday and ordered a Ruffwear approach pack from Muddy Paws. Less than 24 hours later it had been delivered, not bad considering I had used the free postage option. Anyway, time to give Reuben his new present to see what he thought of it. Unfortunately he appeared to be less than impressed. He sat there whilst I put it on with a look that simply said, “What are you doing to me now?”. Fully kitted up he waddled into the garden like a stiff-legged robot for a sniff around. 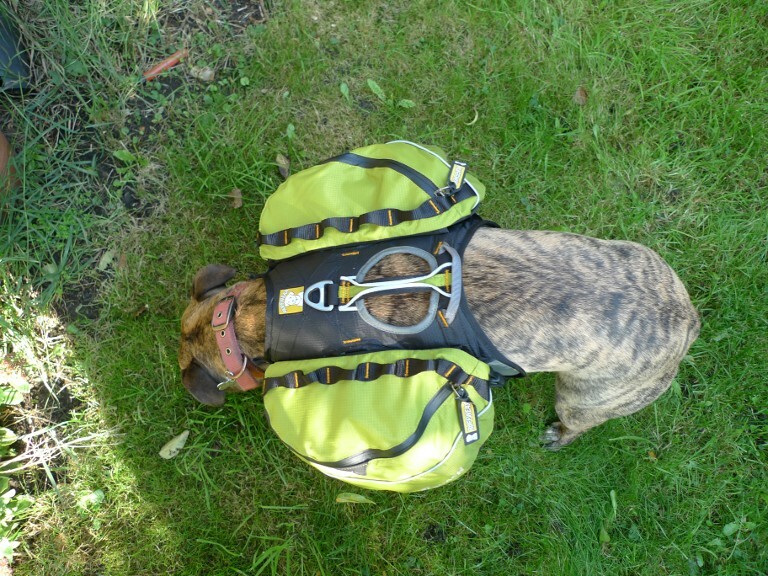 He was a bit like that when he first wore his harness, now he gets excited when he sees it, it means good times ahead. Hopefully he will view his new pack the same way, given time. He will get to use it for a whole week come next Saturday when he takes me bothying in the far north of Scotland. His bothy pal Dougal aka the Hideous Mutt has also got one on order, same colour and everything. Reuben is the canine trendsetter. 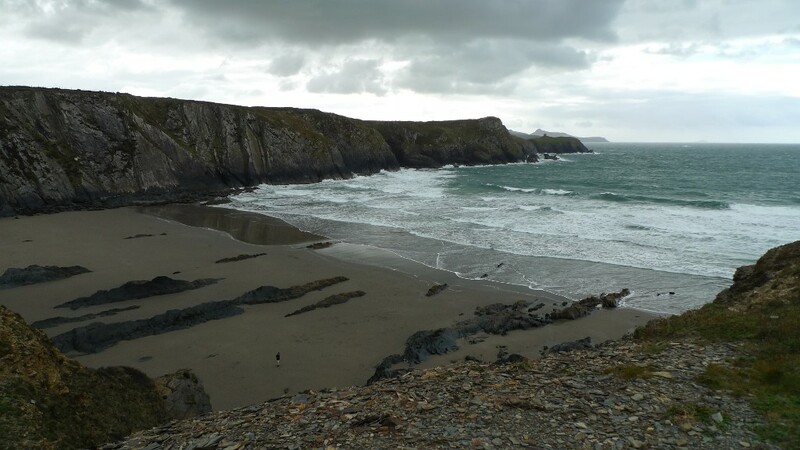 Pembrokeshire is one of those places that has managed to remain off my radar for many years. 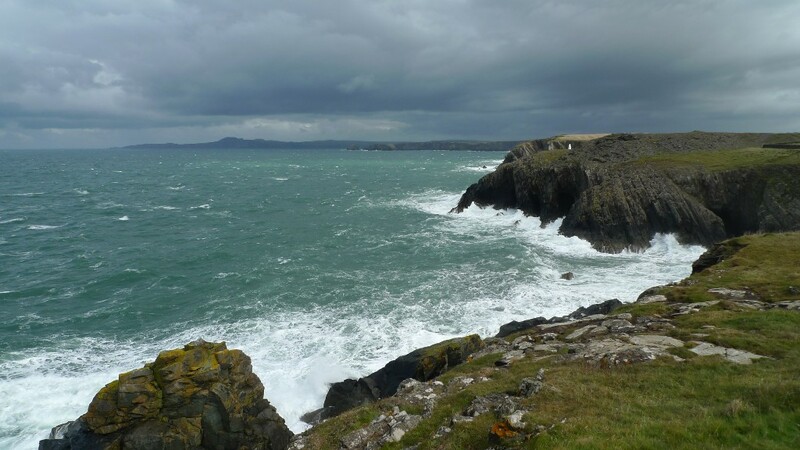 I do love coastal walking but much prefer to get this fix from the Scottish Highlands and Islands. 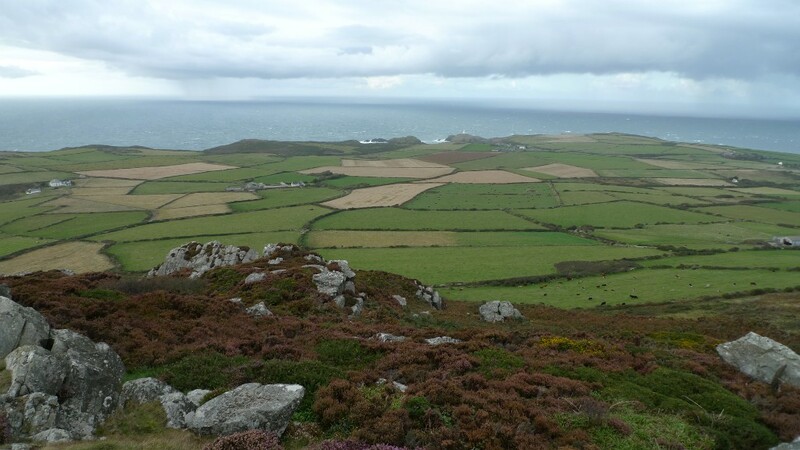 It is remoteness and ruggedness that really floats my boat. I did nearly managed to persuade my partner to spend a week on the Isle of Canna, but in the end the idea of a long and rough ferry crossing after an epic drive put us both off. 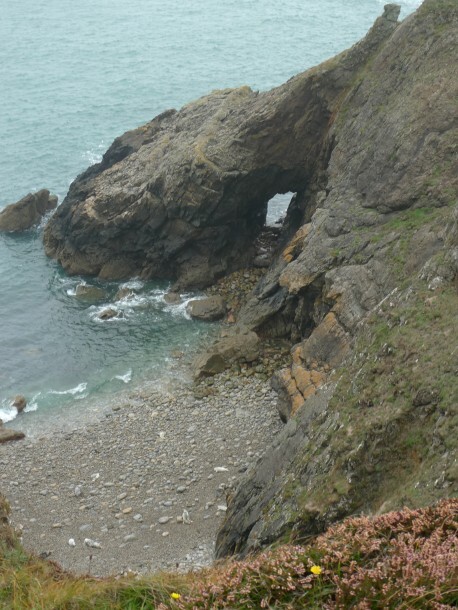 I have to admit that when we arrived in Pembrokeshire I was a little underwhelmed by the scenery. 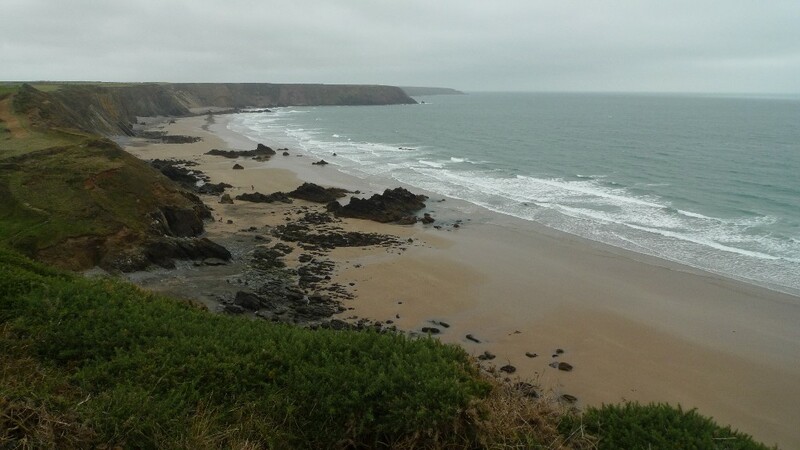 The campsite we booked into was absolutely superb but the surrounding landscape a little uninspiring. It was the drive to the coast the following day that allowed me to map out the landscape in my mind. We drove along twisting narrow lanes next to windswept fields, the area having little tree cover. Overall it was a bit bleak but not in a wild sort of way. 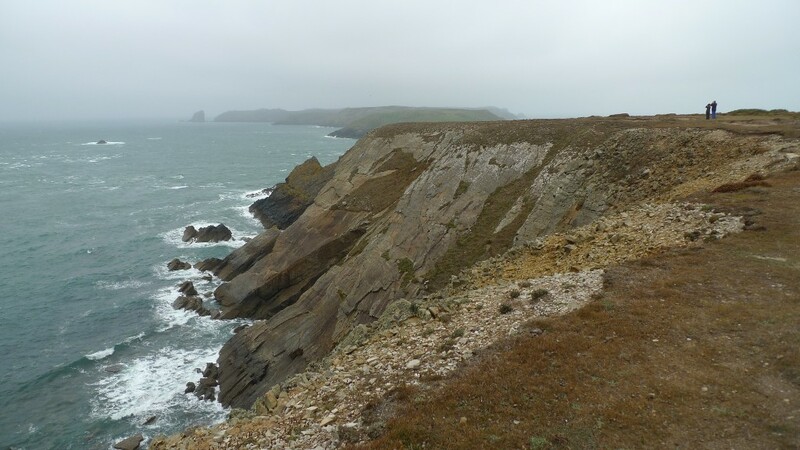 However reaching the coast, the mundane suddenly became the dramatic, every stretch of the coast we saw was as wild as I could have wished for. That is not to say that the interior should be written off, there were some lovely little valleys that we passed through, full of moss laden trees. 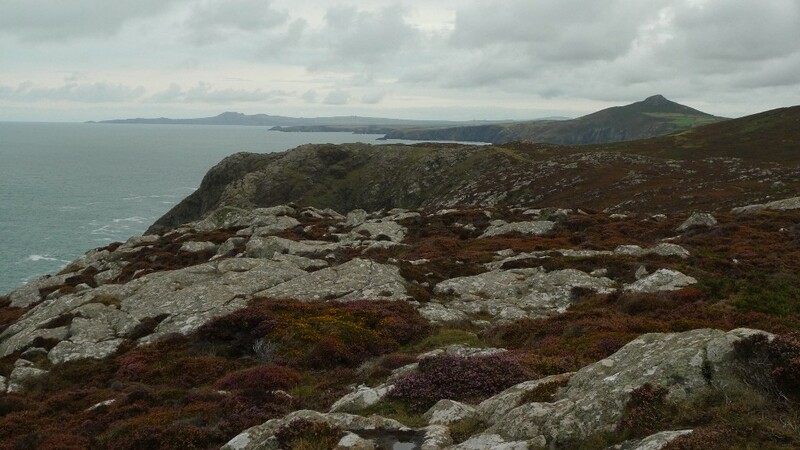 The northern horizon when it was not raining was dominated by the Preseli Hills which unfortunately I did not get a chance to explore. I have to admit that we often played ‘Fantasy house buying’ whilst driving those narrow lanes, wishing that we could live in some of the lovely little cottages tucked into secretive hollows. 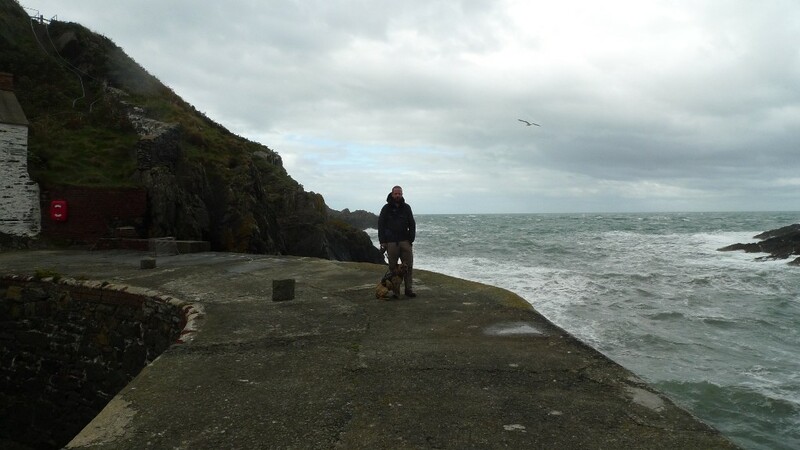 However for both of us, the rugged coast was the star of the show. 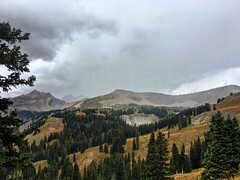 As this was not primarily a hiking or backpacking trip I have not done one of my usual trip reports. Instead here are some photos with a few words about each of the areas that we explored. 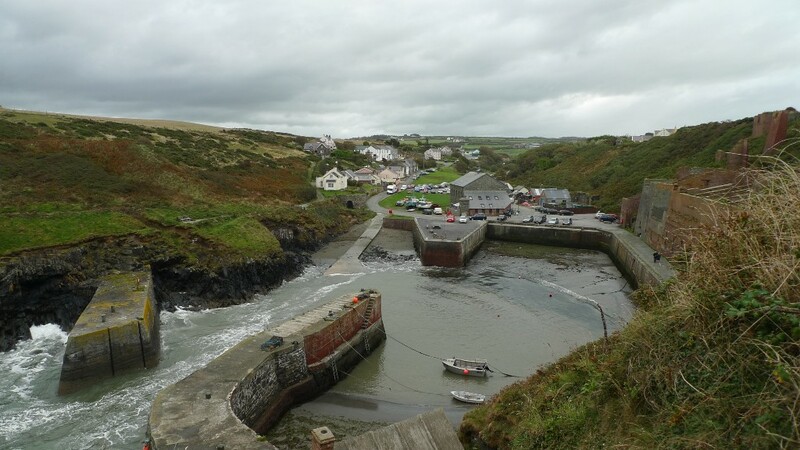 Porthgain is a lovely little village tucked into a valley with a sheltered harbour. It was a Sunday when we arrived and although the weather was very windy and rather grey, the place was packed with vehicles and tourists. 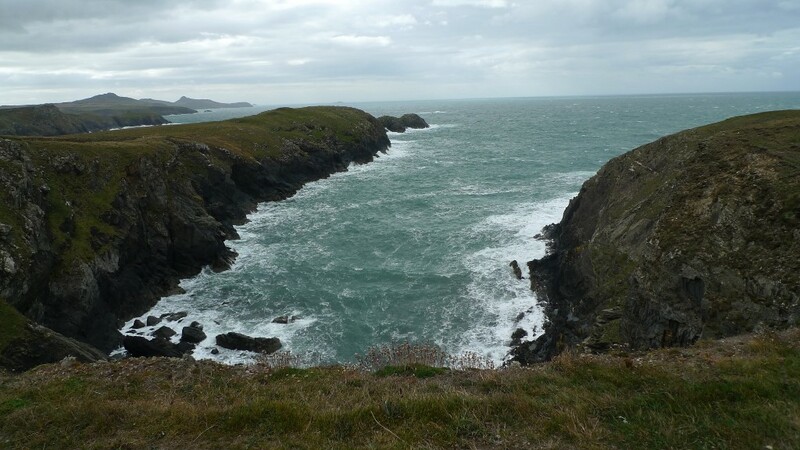 The coastal path to Abereiddy was a delight to walk and level once we had climbed on to the cliff tops. 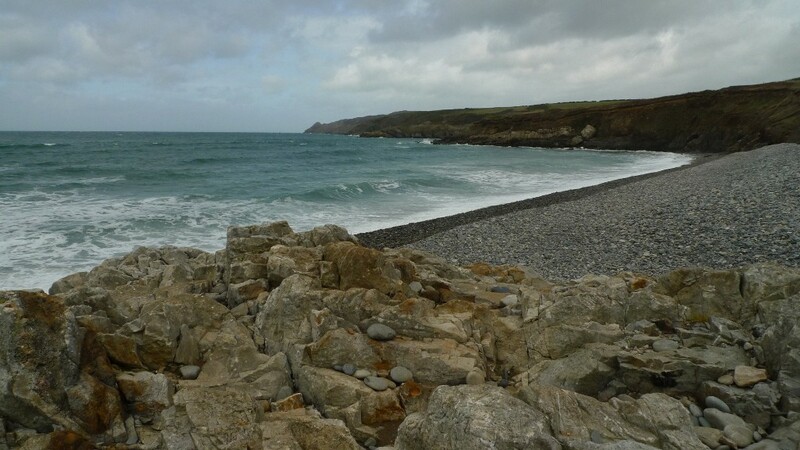 The walk along the cliff tops to Traeth Llyfn was spectacular with its inlets and the heavy swell crashing upon on the rocks. The wind was so strong that foam from the sea was blown up and fell around us like large dirty snow flakes. 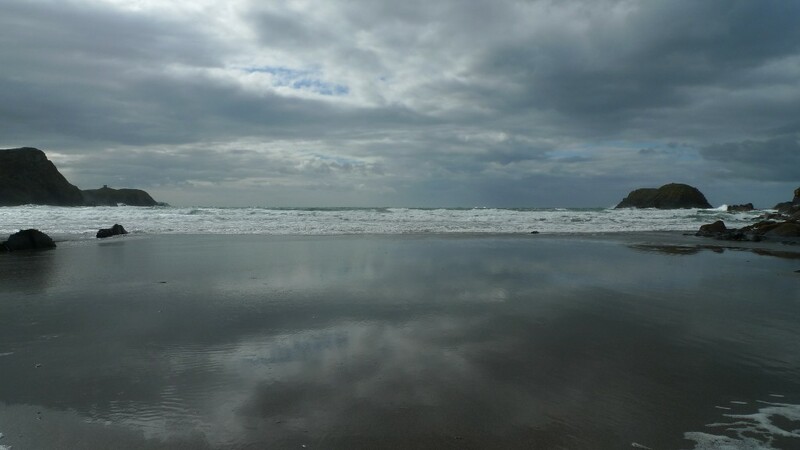 Suddenly the sandy expanse of beach of Traeth Llyfn was below us. The way down was via steps which soon turned into a suspended metal staircase. There were gaps in the floor of the staircase which were too wide for Reubens paws so he had to be carried down, 20kg of squirming dog soon got pretty heavy! 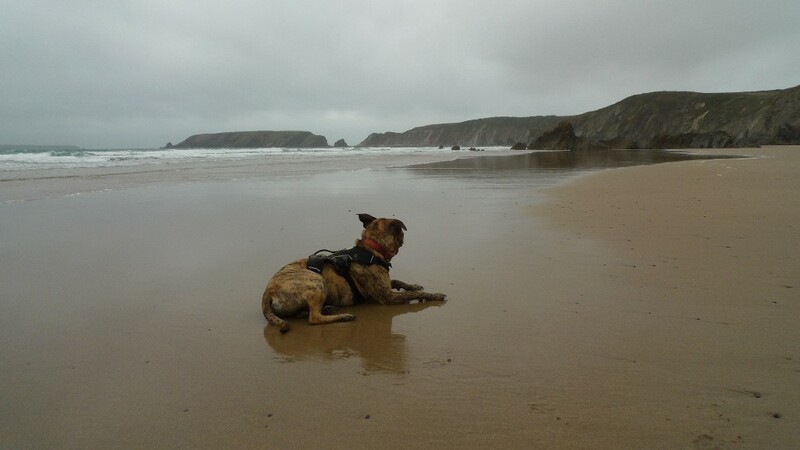 It was Reubens first time on a sandy beach and a switch flicked in his brain. He was soon tearing up and down the beach, a huge doggy grin on his face. He absolutely loved it. This would be a great place to spend a hot sunny day with a good book, simply taking in the scenery whilst the waves pound on the shore. 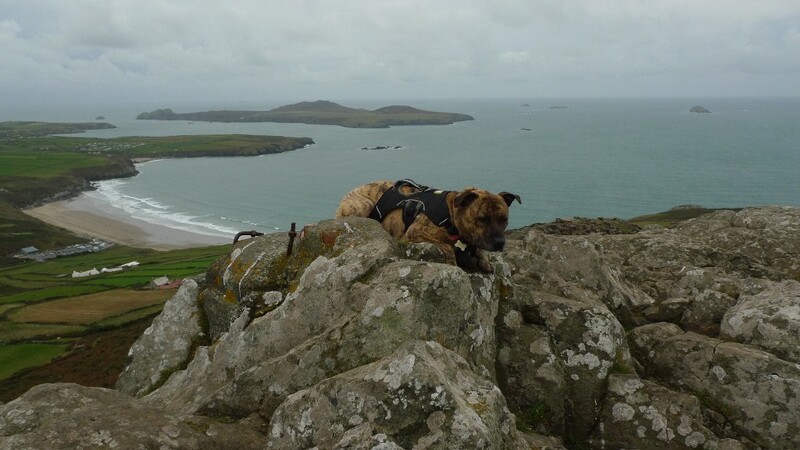 Reuben was even heavier on the way back up where we joined the coastal path back to the beach at Abereiddi via the Blue lagoon. 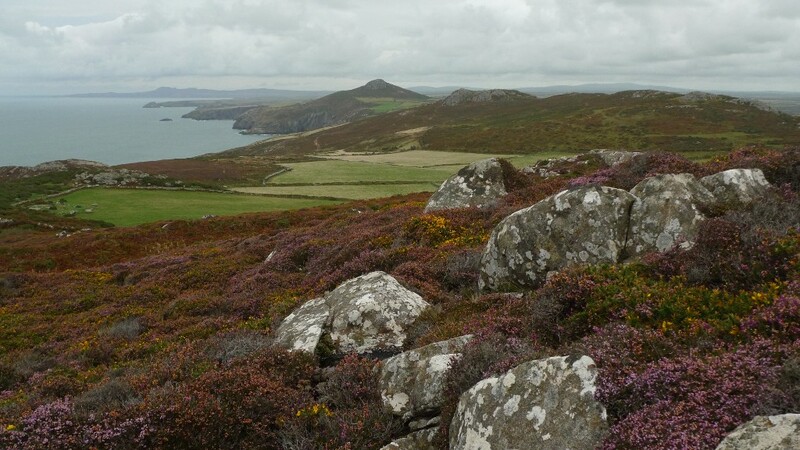 On the Porthgain walk I spotted the hill of Garn Fawr dominating the Strumble peninsula on the horizon. A high level car park at the base of the hill gives access to a footpath, it only took about ten minutes to reach the 213 metre summit. 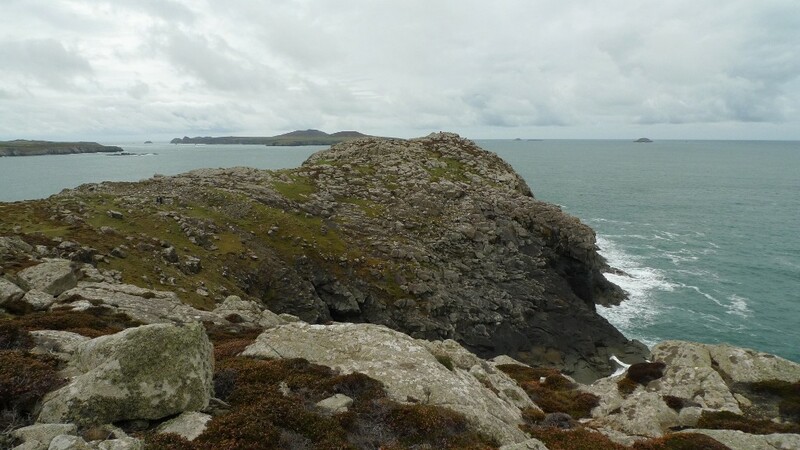 Although a low hill, because it was so close to the sea it gave a much greater sense of height. 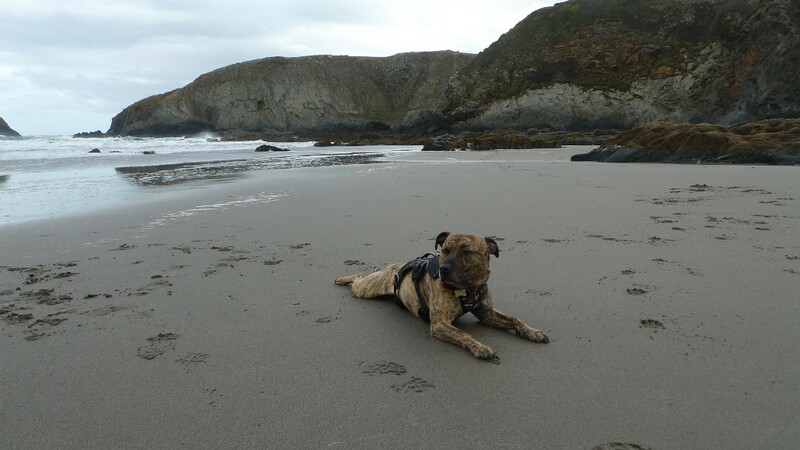 The tide was out when we visited this beach, giving a huge expanse of sand for Reuben to run about on. 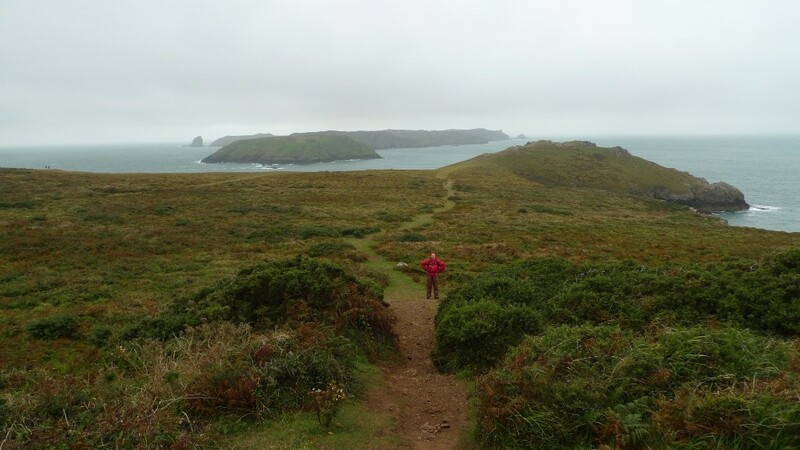 It was great to walk along its windswept length before climbing back up to the coastal path and walking to the peninsula known as the Deer park. 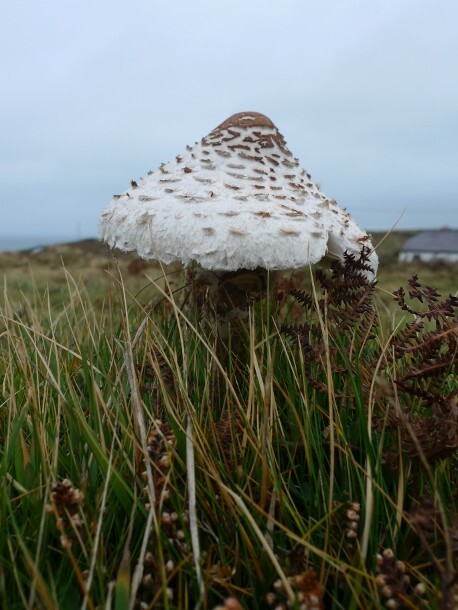 The Deer park was full of these mushrooms, anyone know what they are and if they are edible? 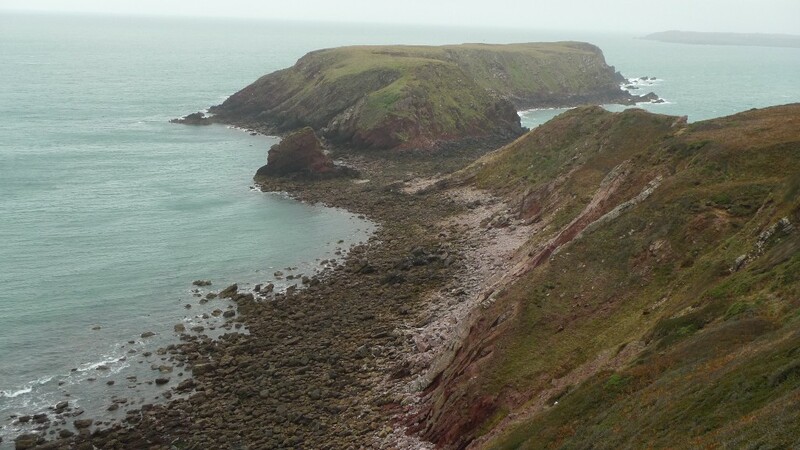 The rugged landscape around St David’s head was my favourite, it had a real sense of grandeur. 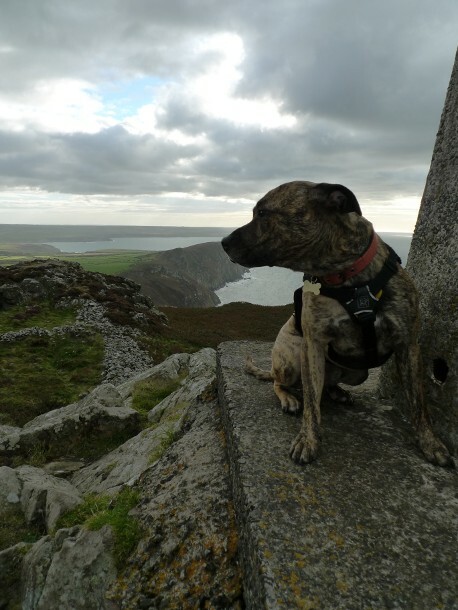 We parked up at Whitesands which unfortunately excludes dogs, instead we took straight to the coastal path. 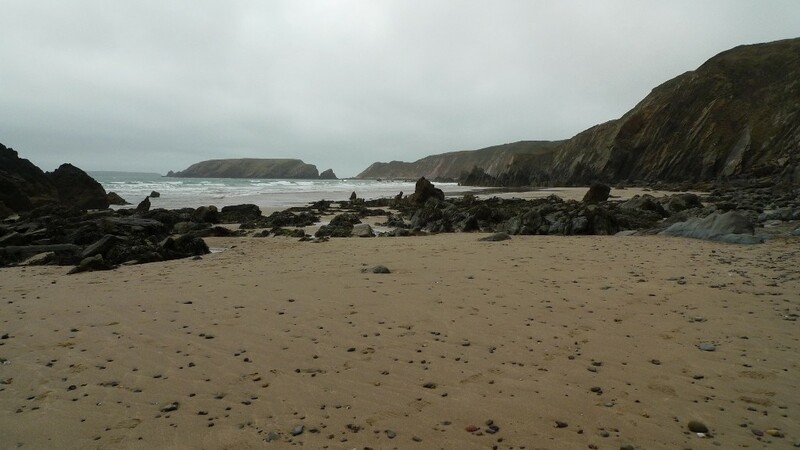 The deserted beach of Porthmelgan was a good excuse to let Reuben off the lead so that he could have a quick race up and down along the water’s edge. 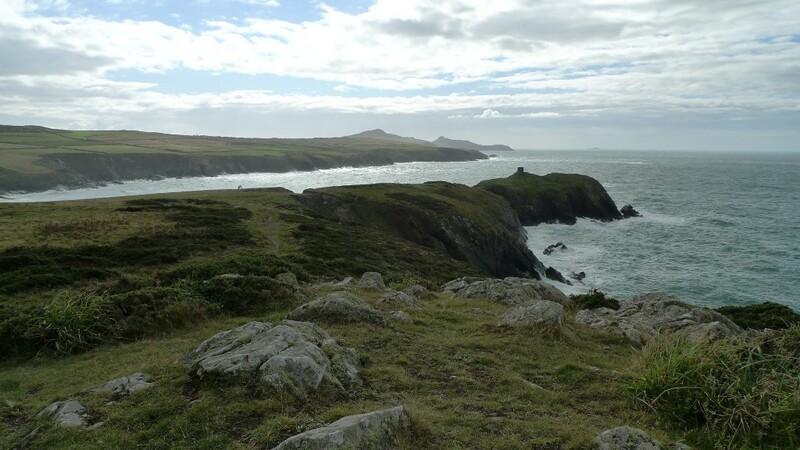 The next stretch of coastal path was quiet after the bustle around Whitesands bay and St David’s head, and had a good wild quality about it. 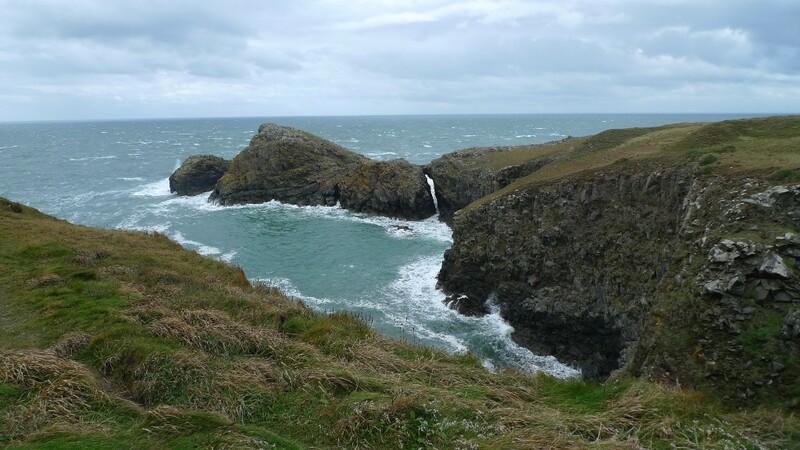 The rugged coast here has a backdrop of steep mini mountains rather than agricultural fields. Carn Llidi is one of these mini mountains and dominates the area despite its lowly height. The final few metres to the summit is a proper little scramble and was totally unexpected. A couple ahead of me retreated after searching around for an easier route to the top. There is not one and I was glad that Reuben was wearing a harness so that I could help him up the more difficult sections. 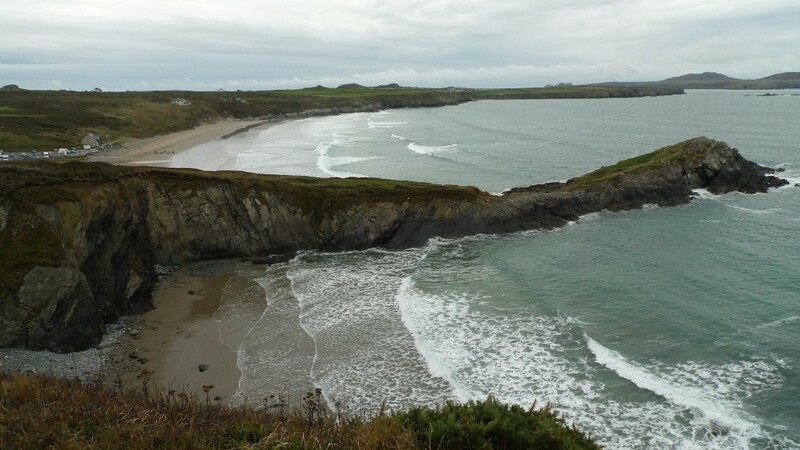 Someone recommended that we walk through the National Trust woods to this beach. Unfortunately we were on our way home and decided on a quick walk before the long drive. Parking at the end of a narrow lane it was only a couple of minutes walk to this wild spot. 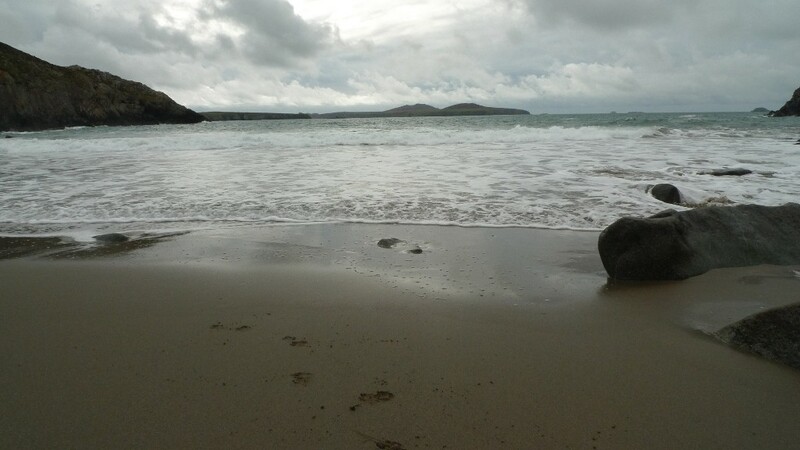 We were even lucky enough to spot a seal lazing around in the surf. 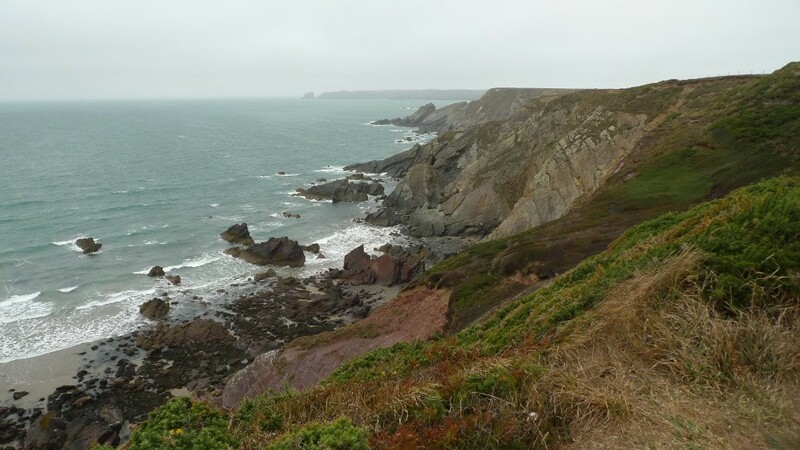 I found that the areas we visited in Pembrokeshire pretty busy (by Backpackingbongo standards) even though the school holidays had finished. However, our campsite owner said that come October the place shuts down for the winter. 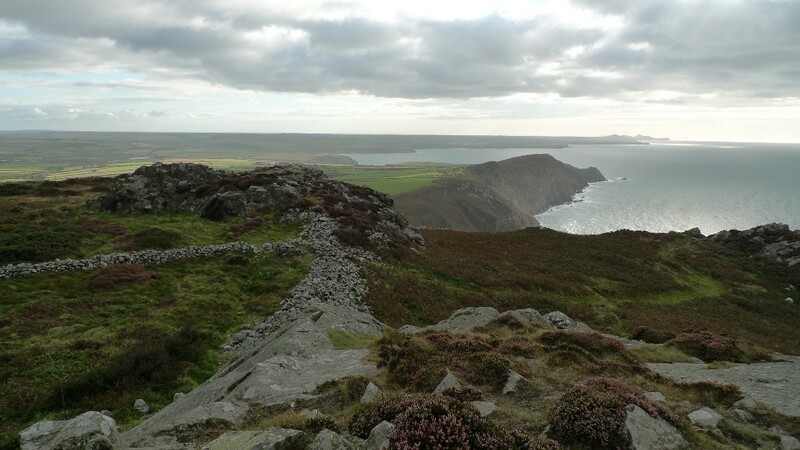 If I returned I would come during the off-season and do a few days of the coastal path, wild camping along the way. 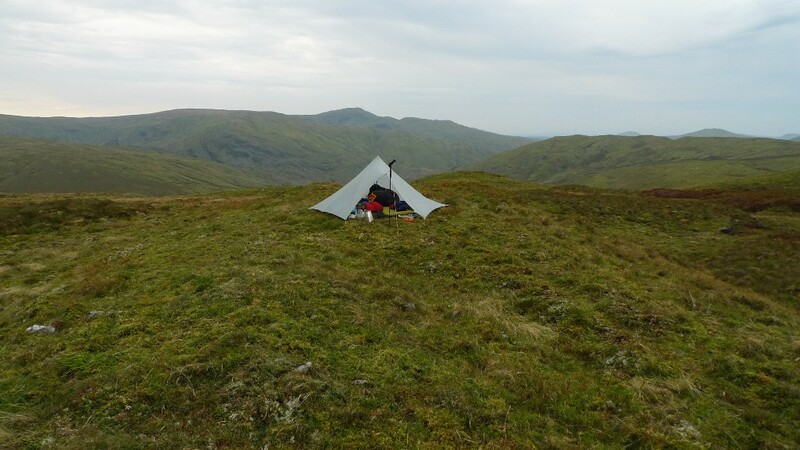 I spotted a couple of areas that looked like they would make cracking camp spots, wind permitting!